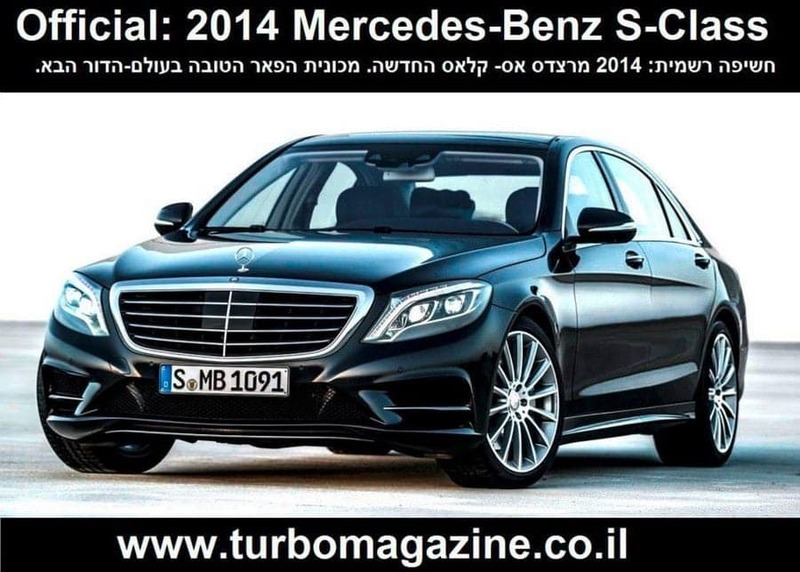 חשיפה רשמית: מרצדס S-Class החדשה 2014 - המכונית הטובה ביותר בעולם. כ"המכונית הטובה ביותר בעולם"היא איננה עוד מכונית פאר. היא מאסטר, מטוות הדרך, "כוכב" הצפון אחריו הולכים כולם. היא פשוטו כמשמעו מובילת כל תעשיית הרכב. לשנת 2014 כולם כולל כוווולם, עוצרים את נשימתם. מנהלים ב 10 שנים הבאות, אלא לפני כן תגענה בקרוב ל..
נמשכות בעיקר מזה 4 עשורים. 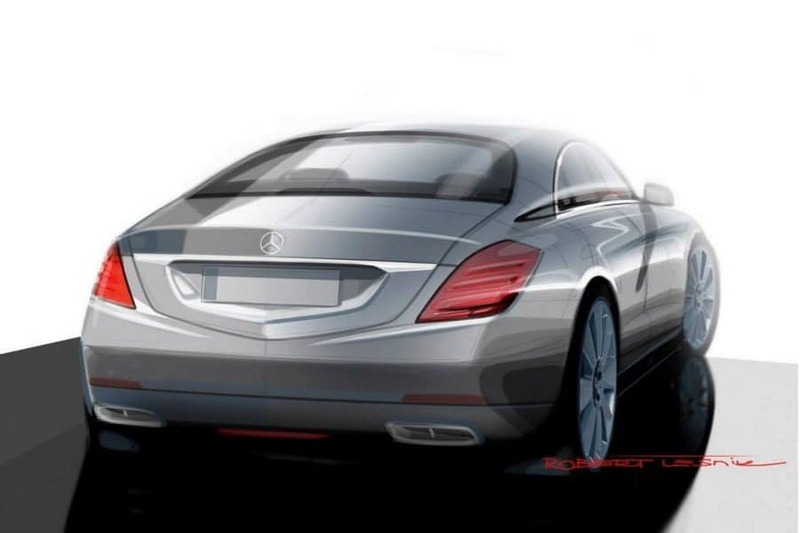 ה- S-CLASS החדשה מקבלת מראה חדש ,רענן ובעיקר אירודינמי משופר. עם מגוון רחב של תכונות טכנולוגיה ייחודיות וחדשניות. ב 150 ק"ג תודות לפיתוח שלדת אלומיניום ופלדה קלה מקודמתה. נותר דומה מאוד לדור הקודם, אך כאמור קל ממנו משמעותית . היושבים ברכב בתאונה קשה במיוחד. 370 מ"מ מלפנים ו- 360 מ"מ מאחור. אותם ניתן להגדיל עוד לכדי 9 מ"מ נוספים. לוח המחוונים כוללים שני צגי 12.3 אינץ' TFT צבעוניים ברזולוציה גבוהה. עד השפיץ של המילה האחרונה טכנולוגית. אנו נציף כמה טכנולוגיות בולטות במיוחד במרצדס S-Class החדשה . הנסיעה הרצויה והאופטימלית ביחס למשטח-כלומר לכביש הנתון. השליטה. מערכת לחנייה עצמית אלקטרונית נתמכת לווין. שנקבעת מראש ע"י הנהג או אוטומטית ע"י המערת לפי בחירה. עוד מערכת מעניינת שפותחה לדור הבא שלה היא מערכת "חוצה תנועה"
עד כמה תלחצו על הדוושה הימנית. המרחק תמיד ישאר קבוע. אוטומטית למספרי החירום לזיהוי מיקומכם המדויק . אור LED מלאה. בפנים ובחוץ, אתה לא תמצא נורה אחת רגילה. בני אדם או כלי רכב/אופניים וכו'. כולל פנסי אינפרא-אדום. גרסת הבסיס S300 דיזל החמושה במנוע 3.0 ליטר V6 המפיק:254 כ"ס. 204 כ"ס המשולב במנוע חשמלי המפיק יחד 228 כ"ס. ה- S300 Hybride שתפיק 200 כ"ס ותהיה חסכונית במיוחד. הגרסה ההיברידת החזקה יותר היא ה-S400 Hybride בעלת 240 כ"ס ועד 260 כ"ס. ועד למהירות מרבית מוגבלת אלקטרונית בת 250 קמ"ש. בהמשך גם זו תוצע בתצורה היברידית בשם S500 . בעלת מנוע V12 זוג מגדשי טורבו המפיק 620 כ"ס. בסוף השנה לקראת חודש נובמבר, תגיע לישראל הגרסה האימתנית S63 AMG . extends the boundaries of technology on many levels. 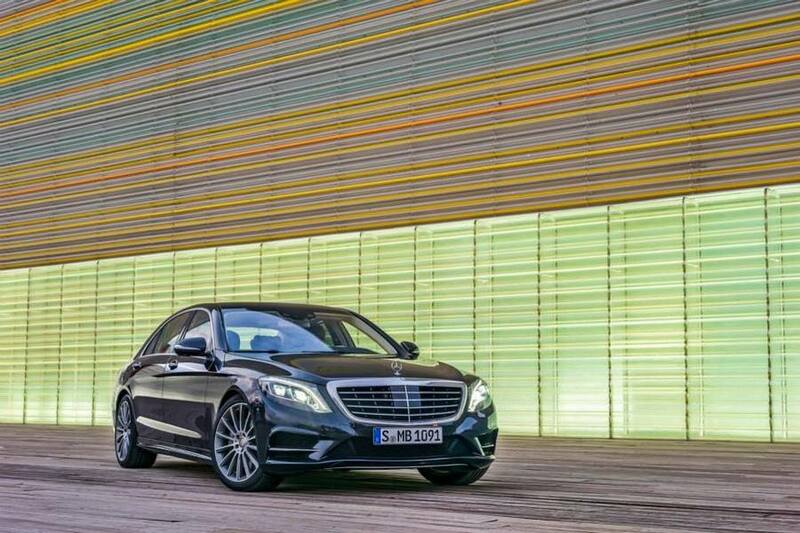 The S-Class is not just a technological spearhead for Mercedes-Benz but for automotive development as a whole. "Rather than being about safety or aesthetics, power or efficiency, comfort or dynamism, our aspirations were 'the best or nothing' in every respect. 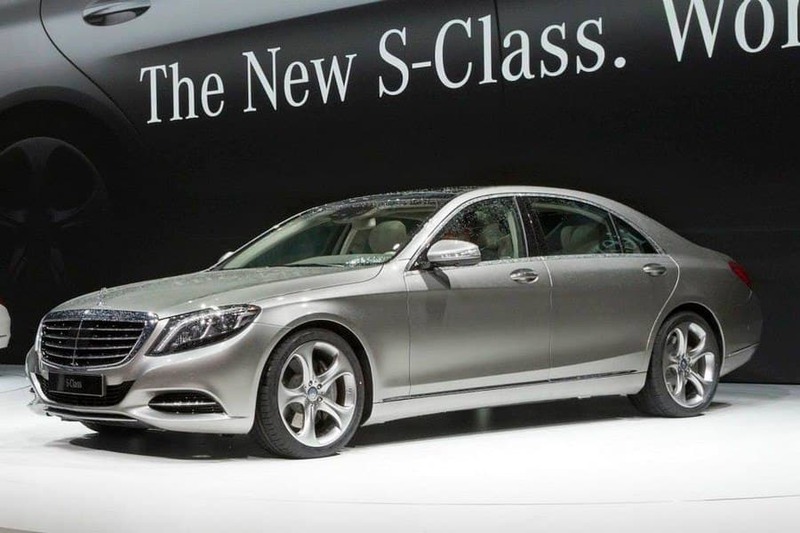 No other car stands for the Mercedes-Benz brand promise more than the S-Class." 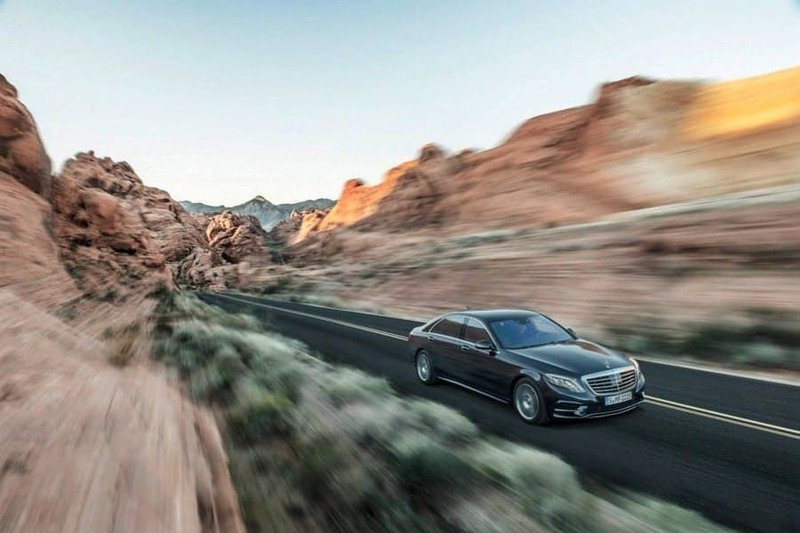 for the Mercedes-Benz flagship model – and for themselves. can also be seen in the rear windscreen, which cuts into the C-pillars. The upper area of the glass is rounded, lending it a coupé-like character. The real highlights are the new-style tail lights which are completely encased by the car body and, thanks to this solitarily integrated styling and meticulously crafted inner workings, complete the design right down to the last detail. 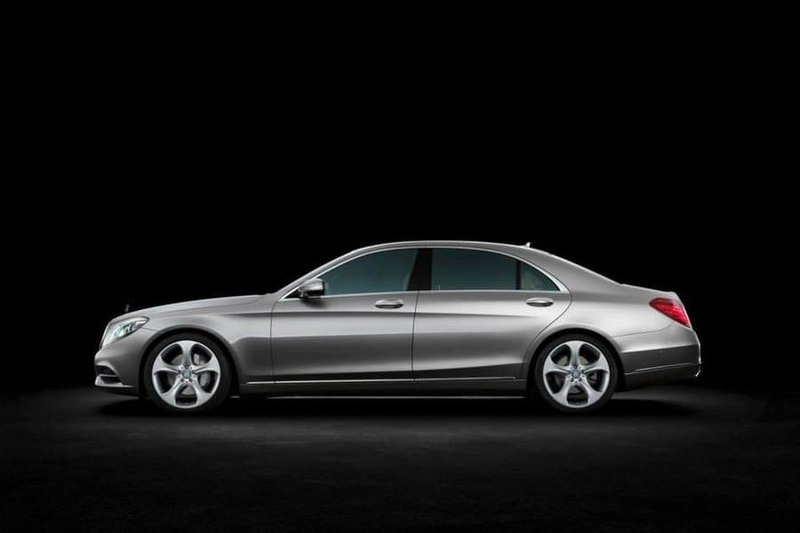 With its clear architecture, the interior design of the S-Class embodies a classic, superior, cutting-edge saloon. The interior's expressive character derives from a uniquely fluid, sensuously elegant style. Horizontal elements and lines create a setting characterised by visual breadth and calm solidity. 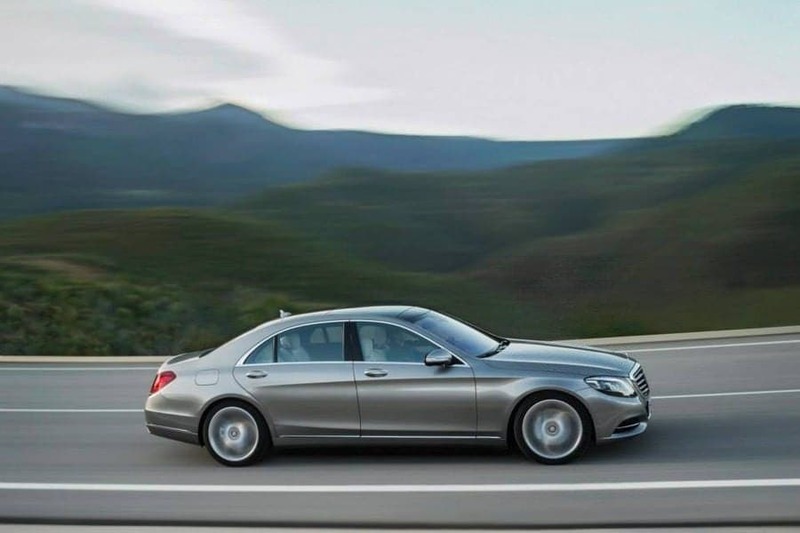 High quality and elegance harmonise with clarity and functionality: the interior design of the S-Class combines ride comfort, spaciousness and user friendliness to the very highest standard. 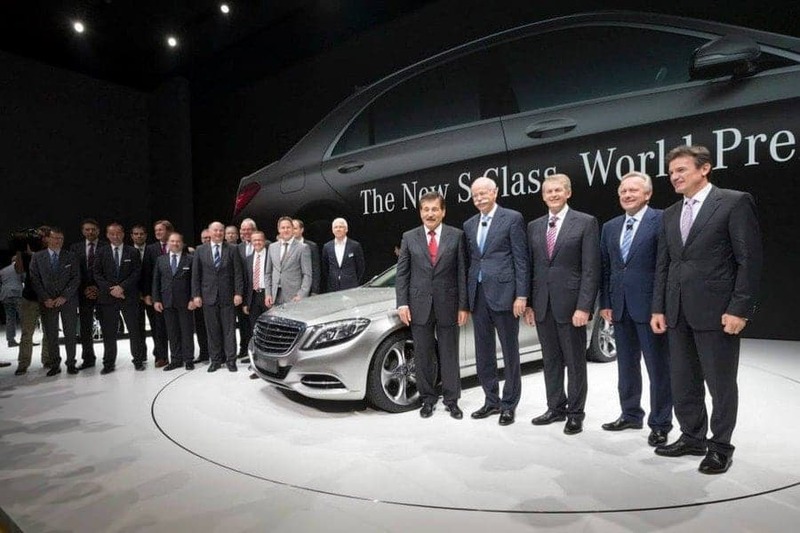 For the first time in the history of the S-Class, the development focus was on the long-wheelbase Saloon. Unlike before, the short-wheelbase version was derived from this. 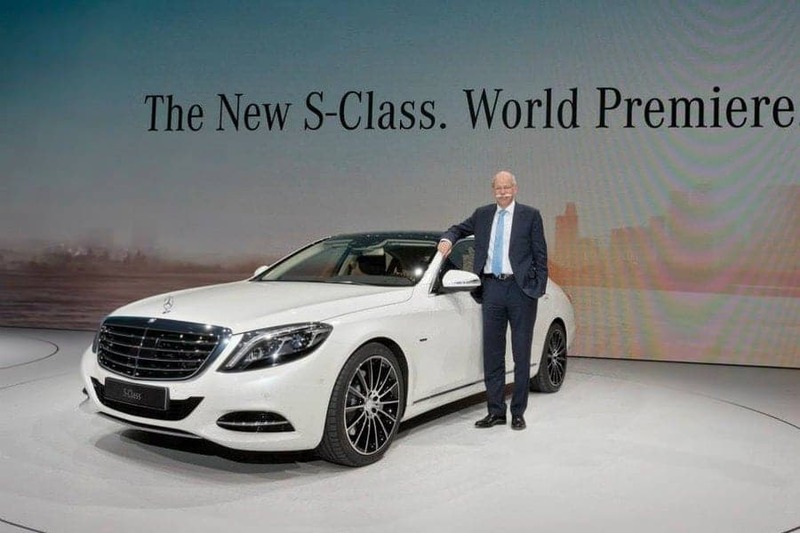 This is because the S-Class is not only firmly positioned as a prestige saloon in the large overseas markets such as the USA, China or Japan. 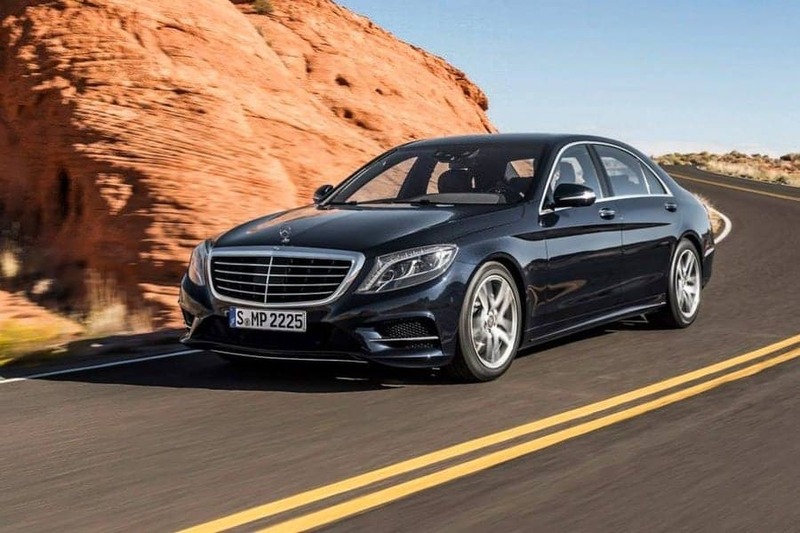 Whereas in Europe and North America owners of an S-Class are frequently behind the wheel themselves, the flagship model in the Mercedes-Benz passenger-car portfolio is very definitely a chauffeur-driven vehicle in Asia. 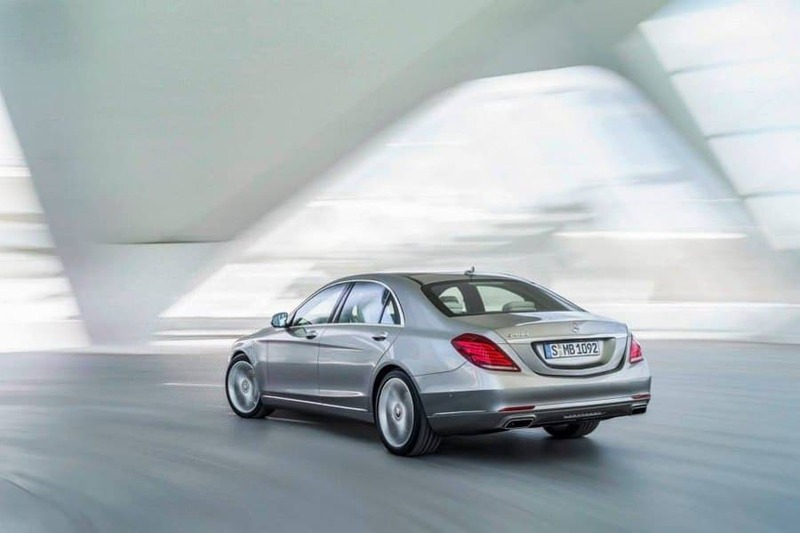 The occupants of the new S-Class benefit from the moderate increase in vehicle size1 by an improvement in all the interior dimensions: there are 12 millimetres of extra headroom for the driver, as well as 14 millimetres more shoulder room and 10 millimetres more elbow room in the front. 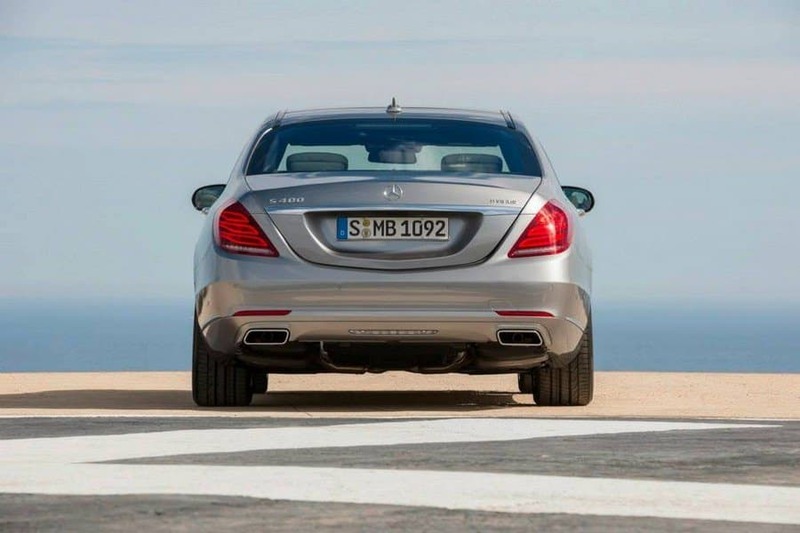 Thanks to the 14-millimetre increase in rear kneeroom, travel becomes even more comfortable for passengers in the rear. Shoulder room in the rear has been improved by up to nine millimetres. 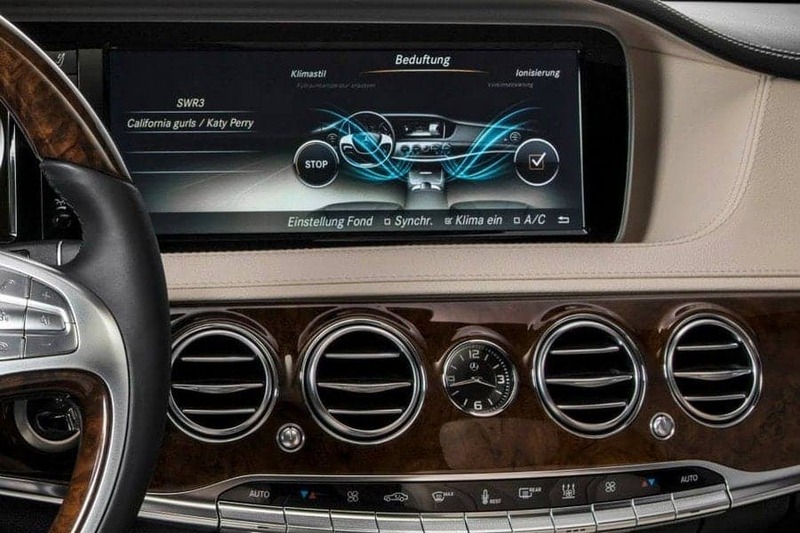 Two high-resolution TFT colour displays in 8:3 format with a screen diagonal of 30.7 cm (12.3 inches) form the new information centre in the S-Class. The left-hand display performs the functions of the previous instrument cluster, providing the driver with all relevant information. The right-hand display allows the convenient control of infotainment and comfort functions. 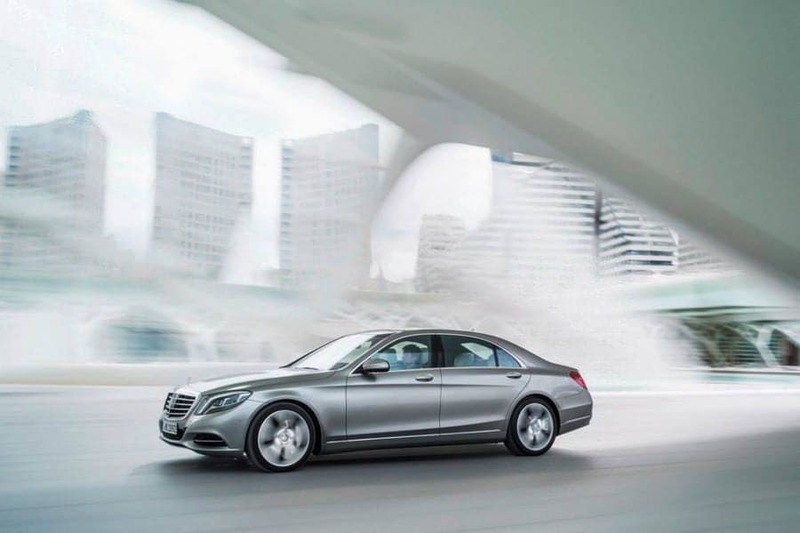 For the new S-Class, the constantly increasing need to integrate additional functions into the vehicle led to a further development of the entire operating logic. Here ergonomics, operating convenience and safety along with attractiveness and aesthetics were the main considerations. The aim in designing the control and display features was to group controls and display functions together in a coherent manner in terms of both design and functionality. Apart from the new displays, the metallised switch surfaces and solid aluminium controls are visual highlights of particularly high quality. 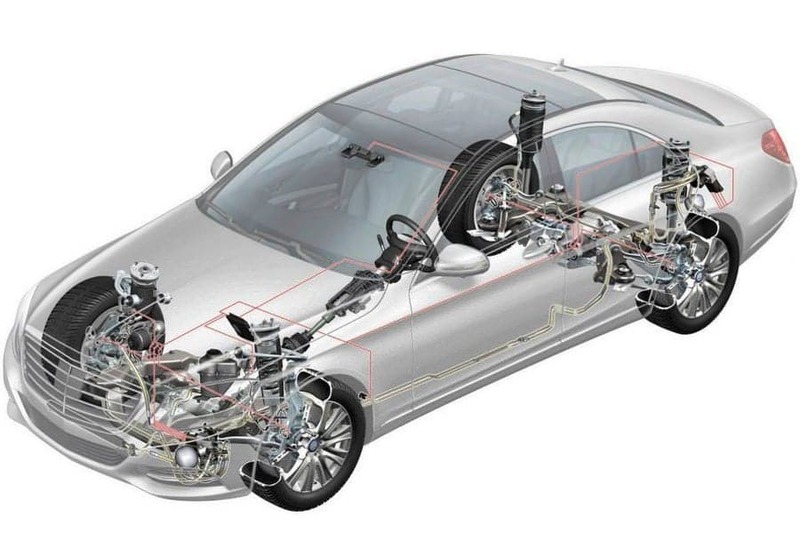 Thanks to the fine structuring on the metal surfaces, each individual control has the sound, feel and attention to detail that makes a Mercedes-Benz so special. During the systematic further development of the entire climate control system, a particular focus was placed on the development goals of performance, air quality, precise regulation, noise level and efficiency. As a new feature, the AIR-BALANCE package comprises perfume atomisation, ionisation and even more efficient filtration compared with the standard model. 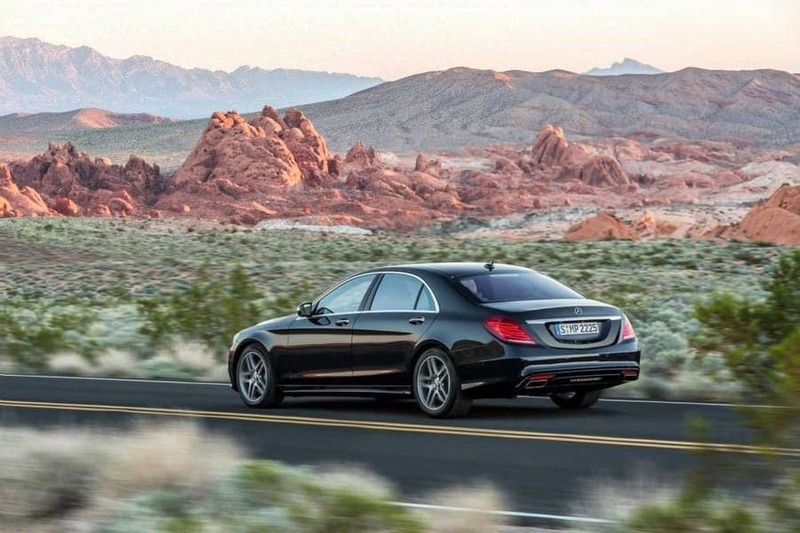 The THERMOTRONIC automatic climate control in the rear has two additional zones to improve thermal comfort. Electric heating of the armrests is a completely new feature. 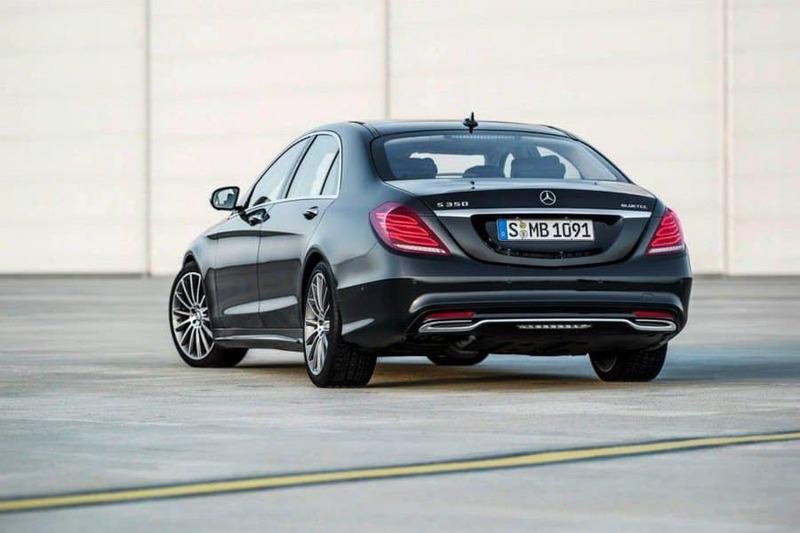 As a world first, the new S-Class Saloon has an "active perfuming system" as part of the AIR-BALANCE package. 'Active' means that the perfuming system is switched on and off manually, with manual adjustment of the intensity. The perfume atomisation system individualises the smell of the vehicle interior. It neither changes the interior smell permanently, nor are perfume molecules deposited on fabric surfaces or clothing. The fragrance is discreet and mild, and dissipates rapidly. 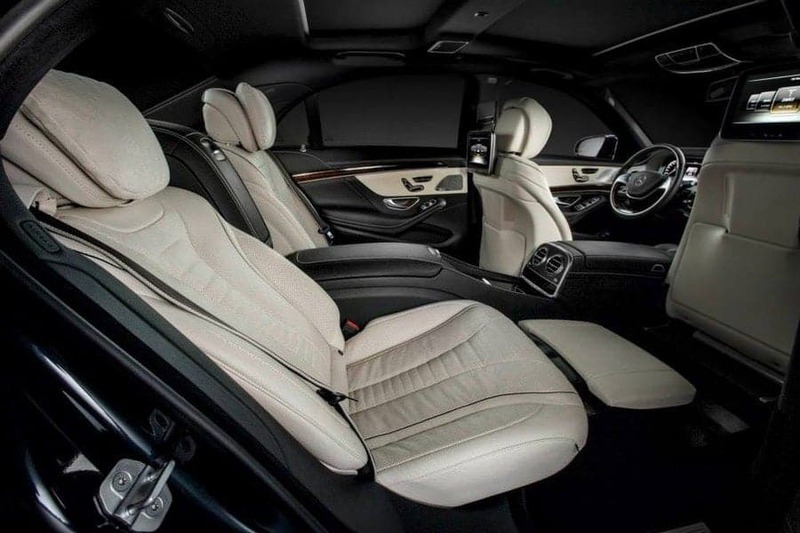 With numerous world firsts such as the ENERGIZING massage function based on the hot-stone principle or active seat ventilation with reversing fans, Mercedes-Benz has raised seating and climatic comfort in the S-Class to a new level. The seat developers have paid particular attention to the rear seats. There is a choice of five different rear seat variants including an Executive seat with a backrest angle adjustable by up to 43.5 degrees, allowing occupants in the rear to concentrate on work or relax in comfort. 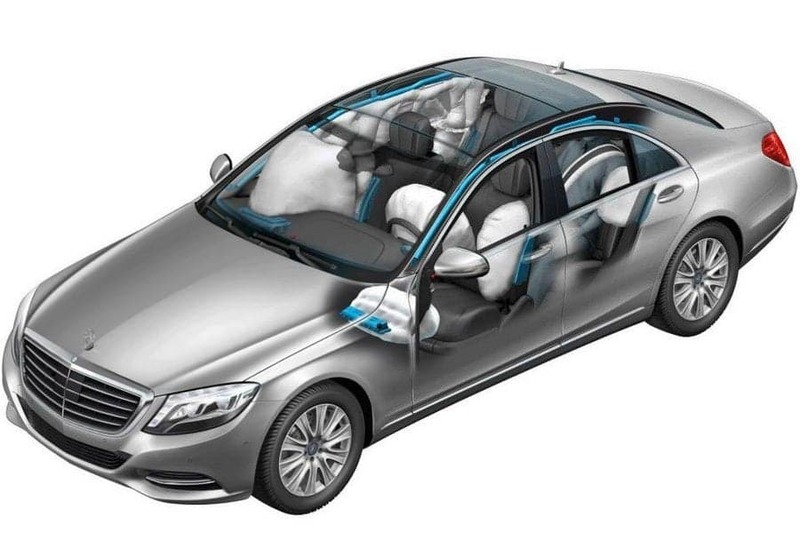 The innovative Frontbass system developed by Mercedes-Benz-and used for the first time in a saloon car is a feature common to all the audio systems: the woofers are housed in the firewall, and use the almost 40-litre space in the cross-member and side member as a resonance chamber. Conventional woofers in the doors are therefore unnecessary. The mid-range speakers in the doors are relocated upwards. This improves the soundscape and allows additional stowage space in the doors. As alternatives to the standard sound system with ten loudspeakers, two very high-quality audio systems are available which were developed together with the high-end audio specialist Burmester: the Burmester® Surround Sound system and the Burmester® High-End 3D-Surround Sound system. Since the 220 model series was developed in the 1990s, with an optimally coordinated materials mix the hybrid lightweight construction has been further developed into an aluminium hybrid bodyshell. During this period the share of aluminium has increased to more than 50 percent. It has therefore been possible to maintain practically the same body weight for 20 years and even slightly reduce it, despite far more stringent comfort and safety requirements and additional functions. In addition to this, structural foams are used at specific points in node areas in the new model series. 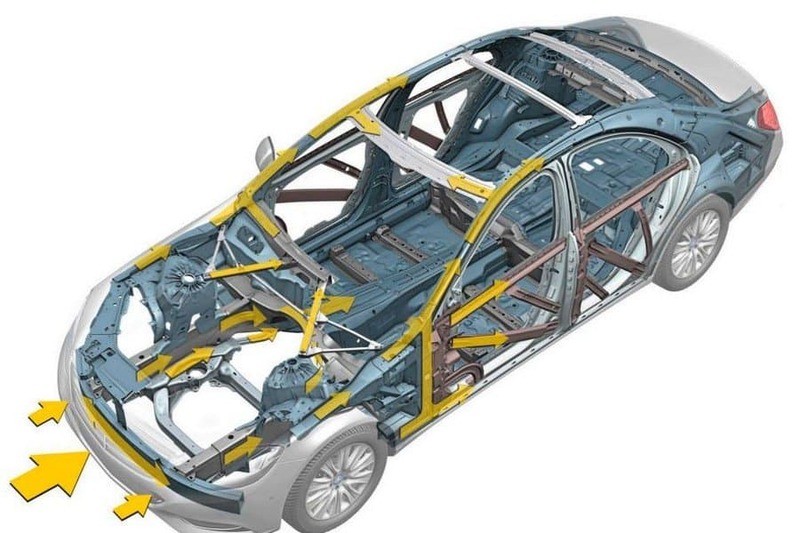 The entire outer skin of the S-Class, including the roof and the front section of the body, consists of aluminium. The high percentage of aluminium is possible thanks to the use of a complete range of semi-finished products (casting, extrusion, sheet metal). 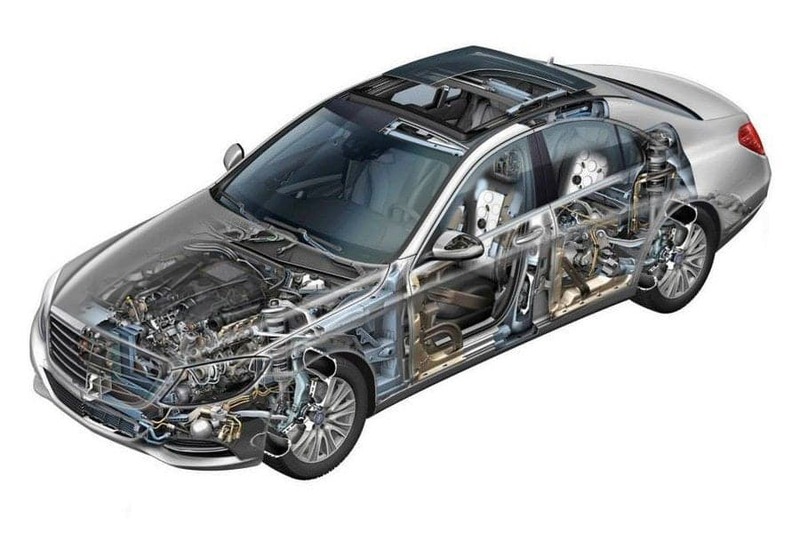 The safety passenger cell is made using an extremely high percentage of high-strength steel. • The PRE-SAFE® Brake can also detect pedestrians and initiate autonomous braking to avoid a collision at speeds up to 50 km/h. • PRE-SAFE® PLUS can recognise an imminent rear-end collision and warn the following traffic by activating the rear hazard warning lights at a high frequency. If the danger of a collision persists, the system can also firmly apply the stationary vehicle's brakes and thus minimise the risk of whiplash injuries by reducing the forward jolt caused by the impact. This additionally can reduce the risk of secondary accidents. Immediately before impact, the PRE-SAFE® anticipatory occupant protection measures, especially the reversible belt tensioners, are deployed. 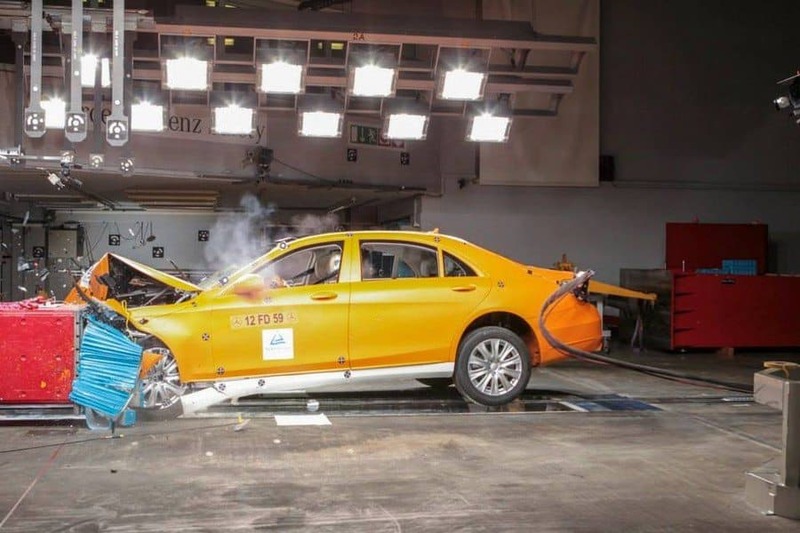 • With PRE-SAFE® Impulse, the driver and front passenger are pulled away from the direction of impact by their seat belts at an early phase of the crash before the resulting occupant deceleration sets in. 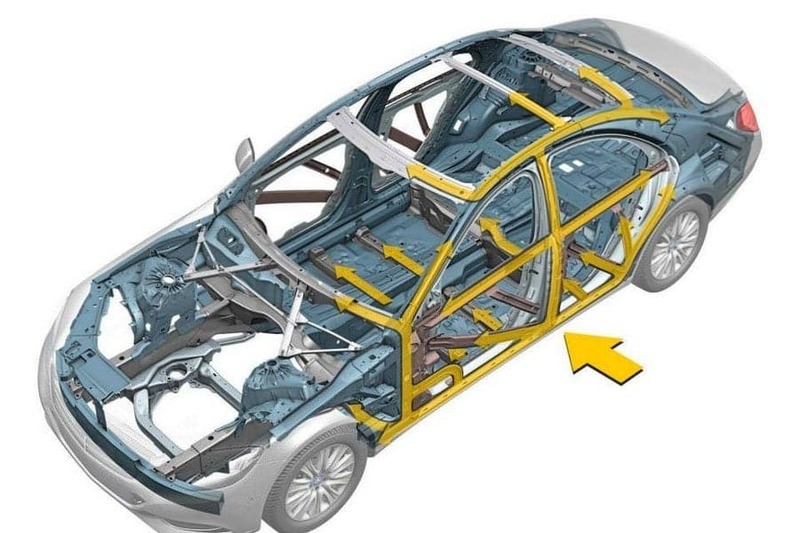 This can substantially reduce the risk and severity of injuries in a frontal collision. 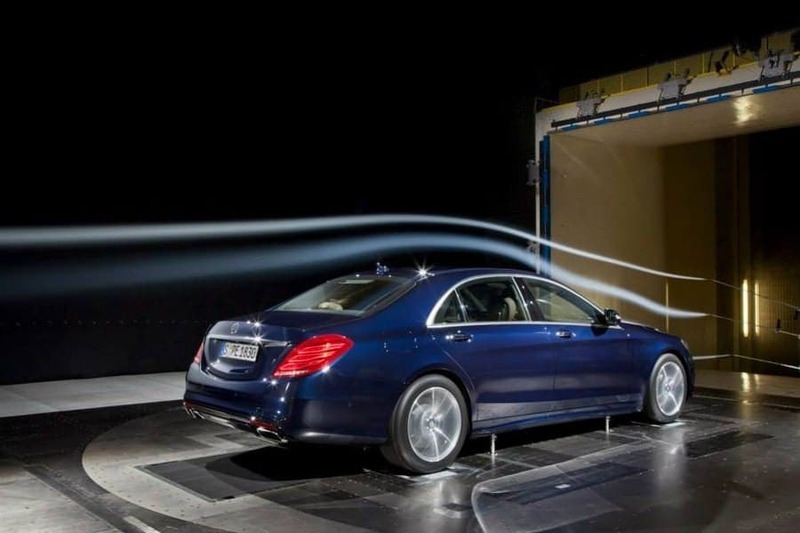 Avoid accidents and mitigate their consequences – this is the integrated approach adopted by Mercedes-Benz Accident Research under the heading" Real Life Safety". 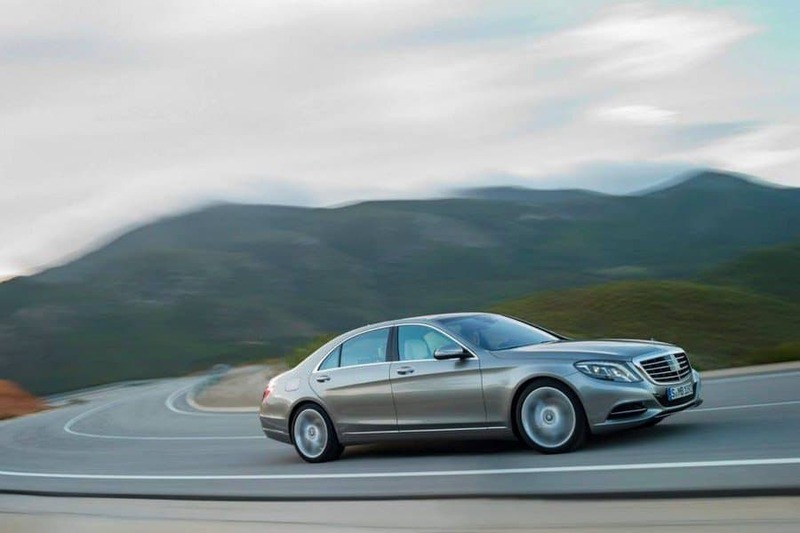 Mercedes-Benz is systematically pursuing this strategy in the S-Class with numerous new assistance systems and greatly enhanced functions. Comfort and safety are enhanced at the same time. 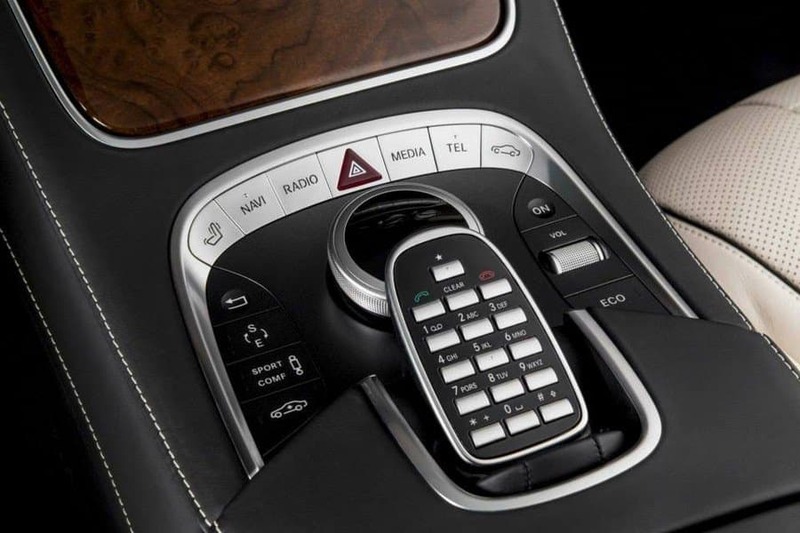 Mercedes-Benz calls this "Intelligent Drive". The new functions all rely on the same sensor system, comprising a new stereo camera together with multistage radar sensors. • DISTRONIC PLUS with Steering Assist and Stop&Go Pilot takes the burden off the driver when it comes to lane guidance and is also able to follow vehicles in traffic jams automatically. • For the first time, thanks to the stereo camera the Brake Assist system BAS PLUS with Cross-Traffic Assist is able to detect crossing traffic and pedestrians too, and to boost the braking power applied by the driver accordingly. • If the lane markings are broken lines, Active Lane Keeping Assist can detect when the adjacent lane is occupied, especially by oncoming traffic, and reduce the risk of the vehicle leaving its lane unintentionally by applying the brakes on one side. 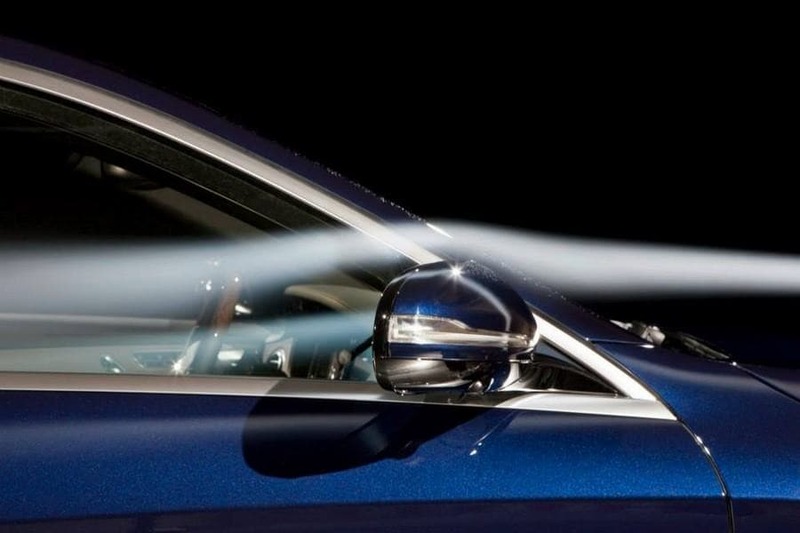 • Adaptive Highbeam Assist Plus allows the high-beam headlamps to be kept on permanently without dazzling traffic by masking out other vehicles in the beams' cone of light. • Night View Assist Plus was further improved and supplemented by a thermal imaging camera. Night View Assist Plus can alert the driver to the potential danger posed by pedestrians or animals in unlit areas in front of the vehicle by automatically switching from the speedometer to a crystal-sharp night view image and highlighting the sources of danger. A spotlight function is furthermore able to flash any pedestrians detected ahead. This attracts the driver's attention to the source of the danger at the same time as warning the person on the side of the road. • ATTENTION ASSIST can warn of inattentiveness and drowsiness in an extended speed range and notify the driver of their current state of fatigue and the driving time since the last break, offers an adjustable sensitivity setting and, if a warning is emitted, indicates nearby service areas in the COMAND navigation system. 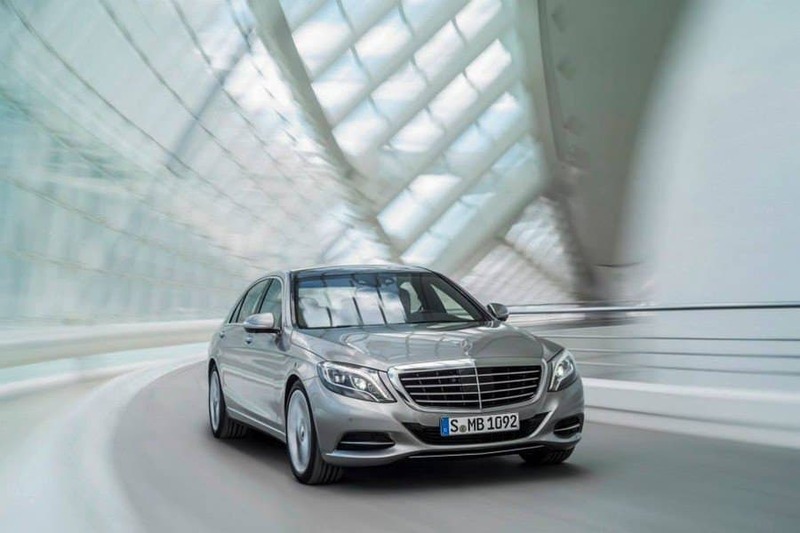 "A few years ago, the progress made in efficiency would have sounded like a utopian dream: within ten years, Mercedes-Benz has almost halved fuel consumption in the 150 kW output category. 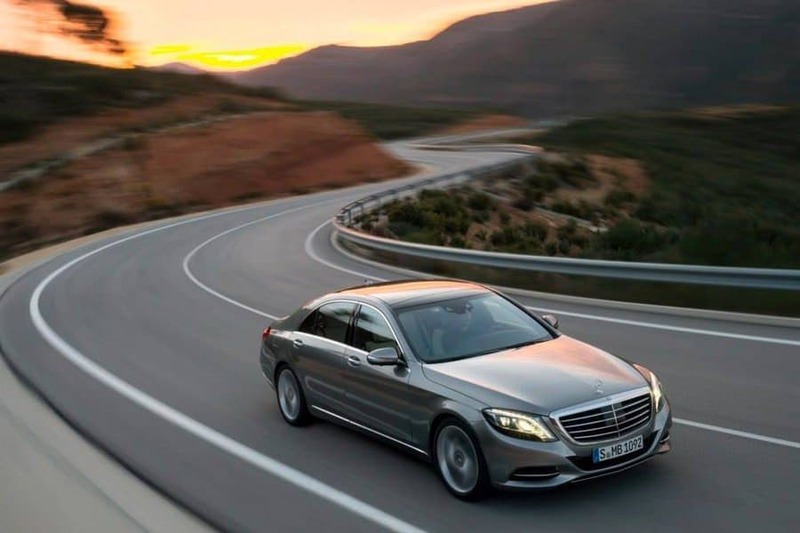 Intelligent Drive is likewise leading the way by networking the sensors to enhance comfort and safety." 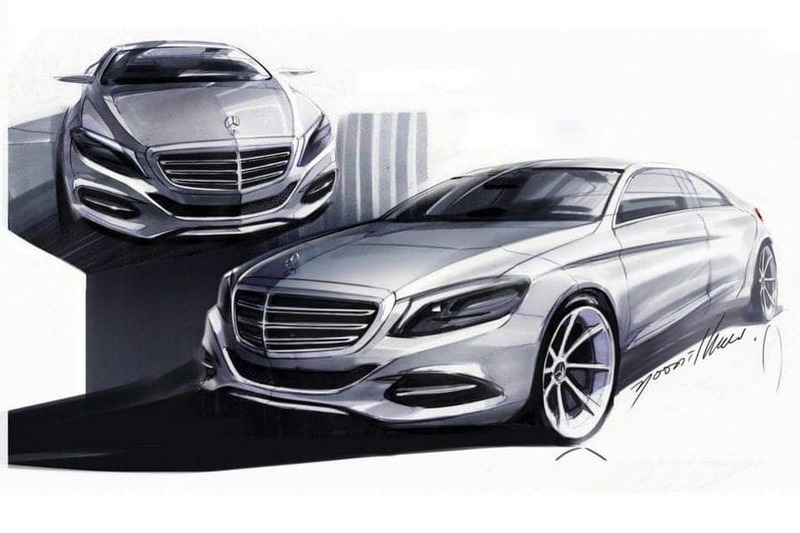 "The S-Class is not just the spearhead for Mercedes-Benz but for automotive development as a whole. And it has been for decades. 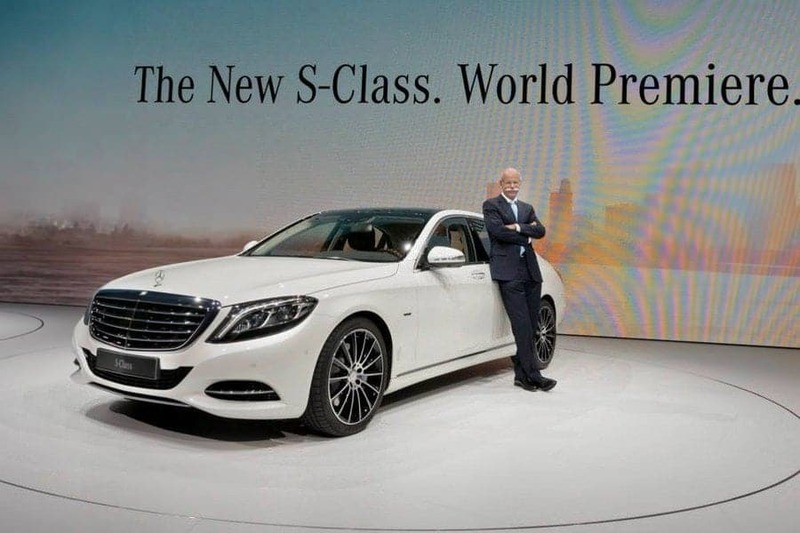 That's why the S-Class is also the world's best-selling luxury car." 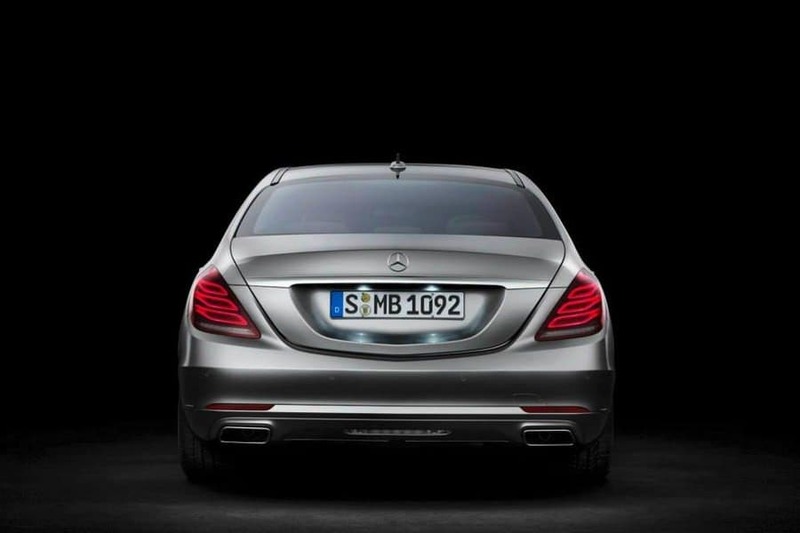 "The sophisticated design of the S-Class has always been an expression of luxury and automotive grandeur of its era. 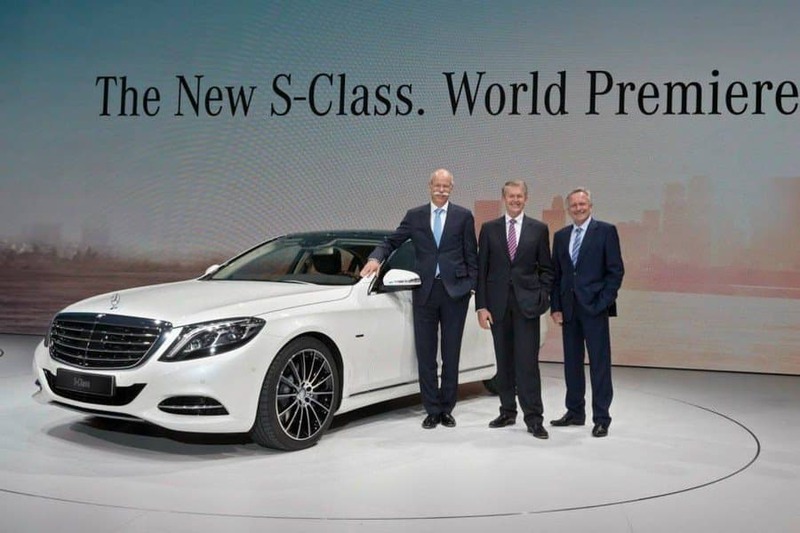 And our new S-Class continues this tradition. With its classic architecture and flowing silhouette, it is a modern embodiment of sensual clarity. The design draws a line from the sophisticated, progressive design idiom to the classic elegance of our 1930s cars – intelligence that speaks to the emotions. 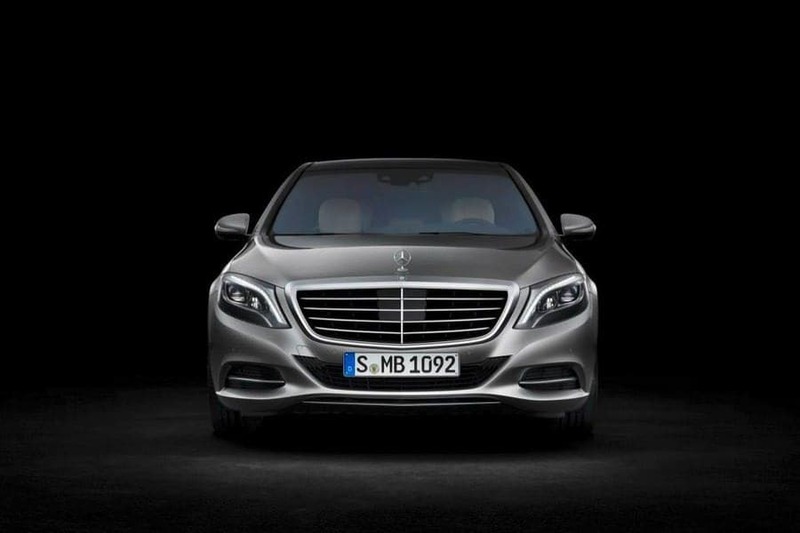 Stylish sportiness and sensual forms in synthesis with timeless clarity and effortless superiority make the S-Class a true design icon." 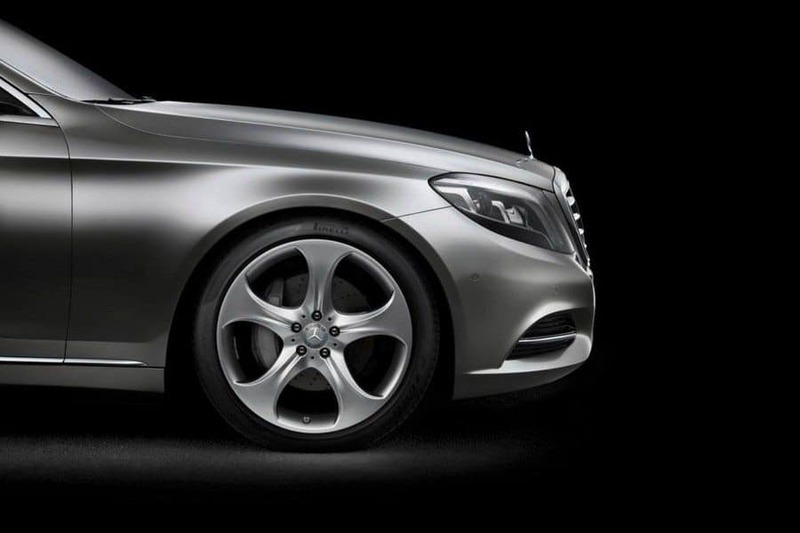 People all over the world can recognise a Mercedes-Benz straight away. 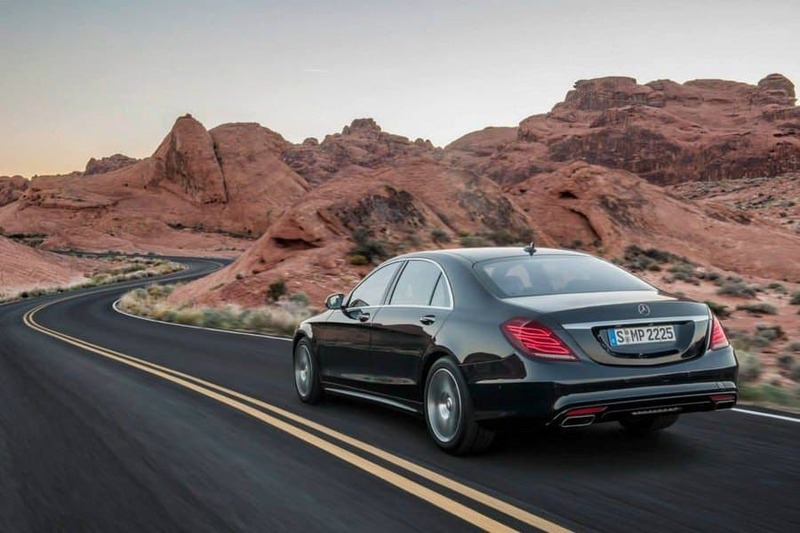 The classic Mercedes face runs like a golden thread through the brand's history. 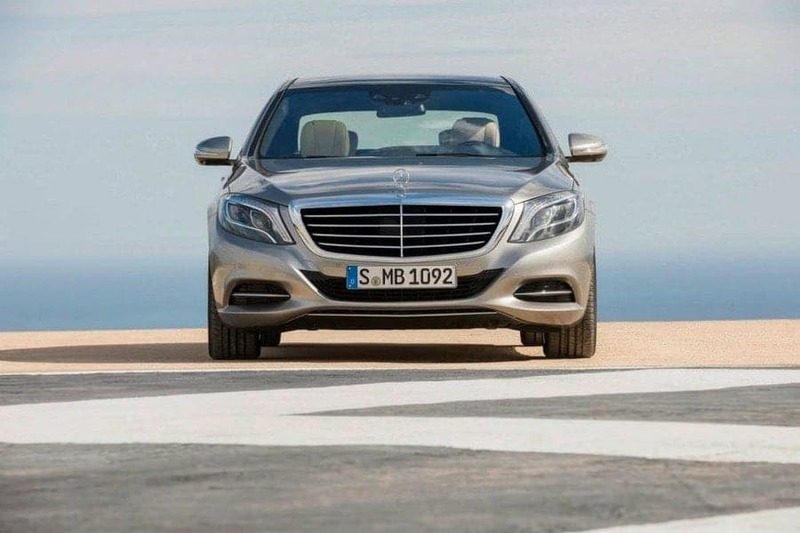 The features of the style-defining front design are both simple and complex, especially on the S-Class: it is strong in character and unmistakable and, instead of following fads, it exudes confidence and status. An alpha leader, dynamic yet not aggressive, sophisticated yet not fancy. 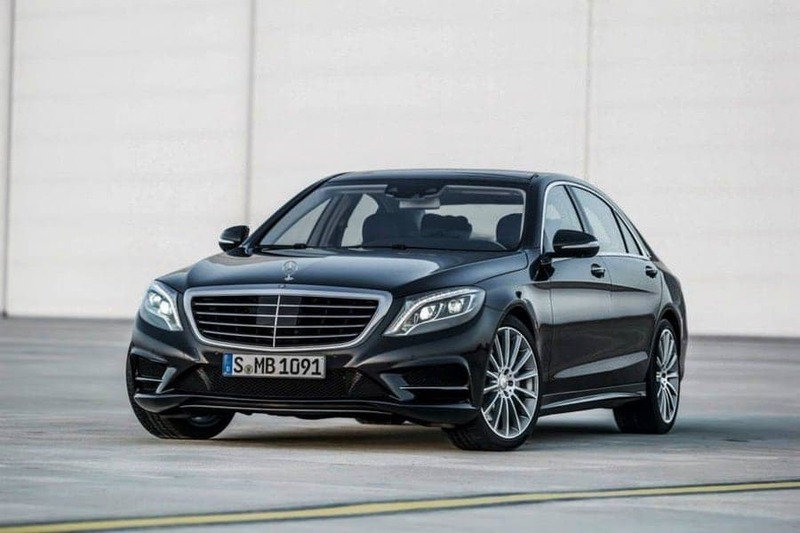 To underline the effortless superiority of the new S-Class, and its ambition to lead, the radiator grille is now larger, upright and distinctly three-dimensional in design. The four louvres taper outwards and do not touch the chrome frame. Instead of diamond-shaped perforations, the lower air intake now features tiny louvres in high-gloss black, which follow the shape of the grille. The front-end design is completed by a chrome strip on the lower part of the bumper. 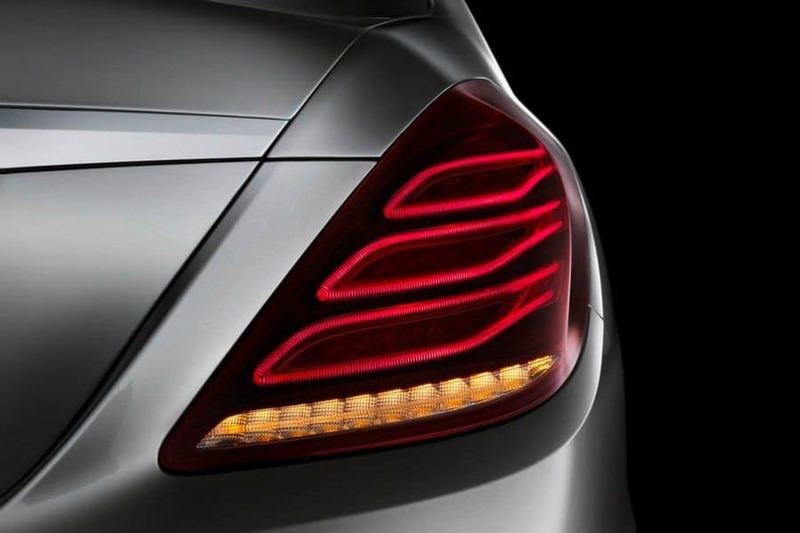 The headlamps have clearly defined contours. In the case of the dynamic LED High Performance headlamps with Intelligent Light System (optional), the indicators, side lights and daytime running lamps are arranged behind the lens so that the brand's hallmark "torch" is immediately recognisable both day and night. 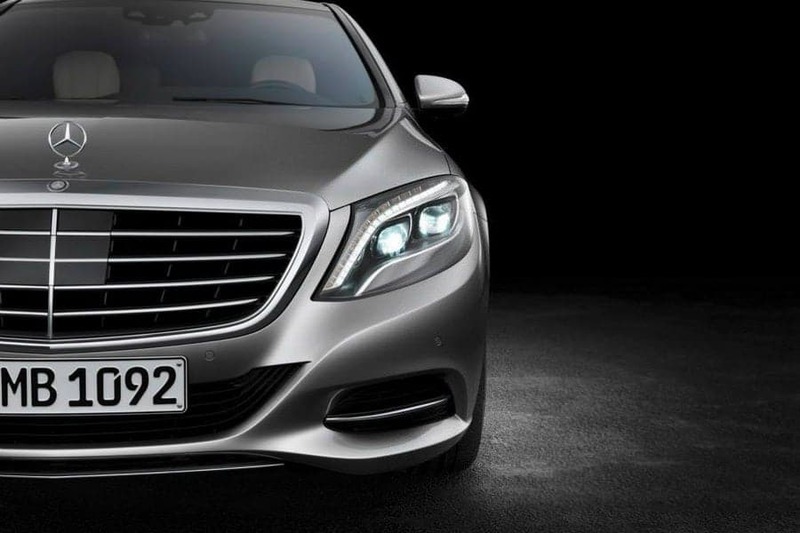 The Mercedes-Benz lettering in the headlamp is illuminated. The greater need for passive and active pedestrian protection has likewise been taken into account in the front design. The additionally required crash gaps have been ideally configured to lend the front end greater presence and a more dominant feel. 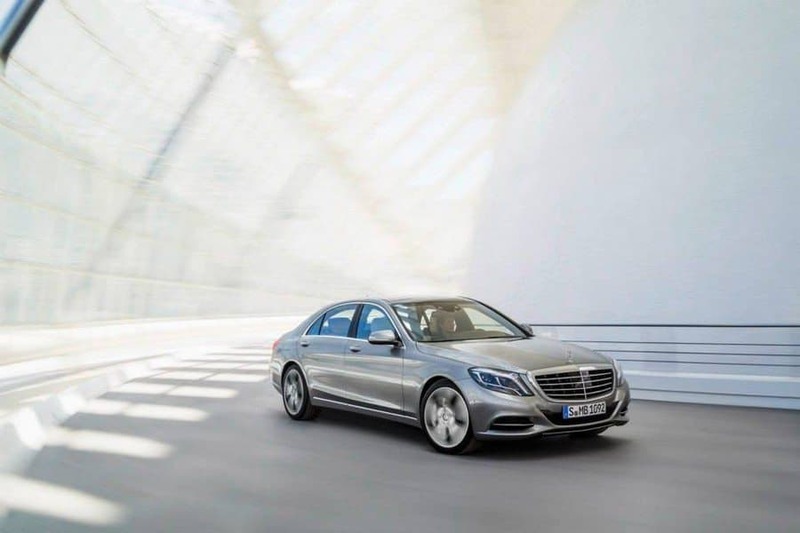 With its long bonnet, the flowing, domed roof line and the gently slanting rear end, the new S-Class has classic saloon proportions. 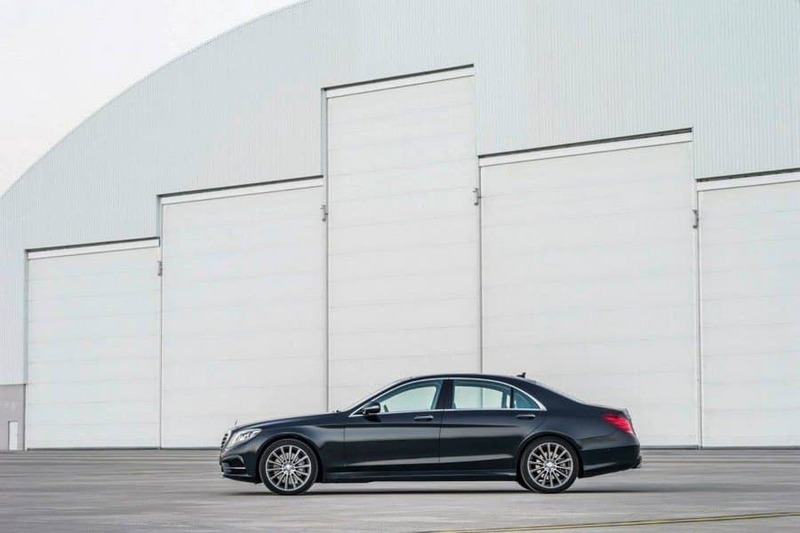 The size and space have been fashioned in such a way that the new S-Class appears prestigious, and the powerful roof line is also in keeping with the car's sporty coupé-style intentions. A character line descending discreetly from front to rear – the brand's hallmark "Dropping Line" – elegantly structures the side wall and generates additional dynamism even when the car is at a standstill. The subtly created convex/concave effect of the entire flank gives rise to an extremely powerful and elongated car body that demonstrates both excitement and calm. 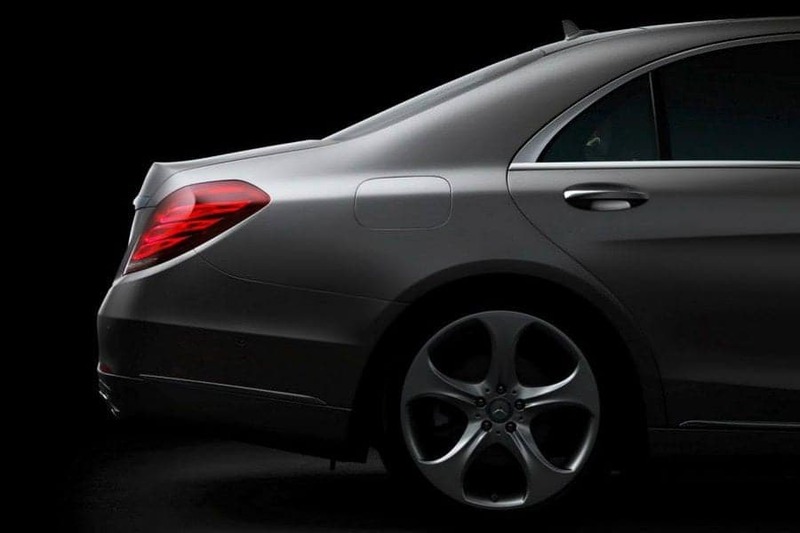 The pronounced shoulder above the rear wheel adds further emphasis to the car's athletic character. Every detail and each of the detachable body parts have been stylistically optimised. The exterior mirrors, for instance, have a new, more dynamic form, while the precisely shaped exterior handles emphasise the body's distinctive lines. The overall composition is accentuated by elegantly designed chrome trim strips, notably the trim strip on the rear door frame, which widens rearwards in one piece. The likewise three-dimensional trim strip at the bottom sits deeper and establishes a visual link with the doors' functional gap. Consequently the sheet metal remains untouched, and an eye-catching design feature is created. The chrome strip has a plastic support element at the bottom to protect against stone chipping. 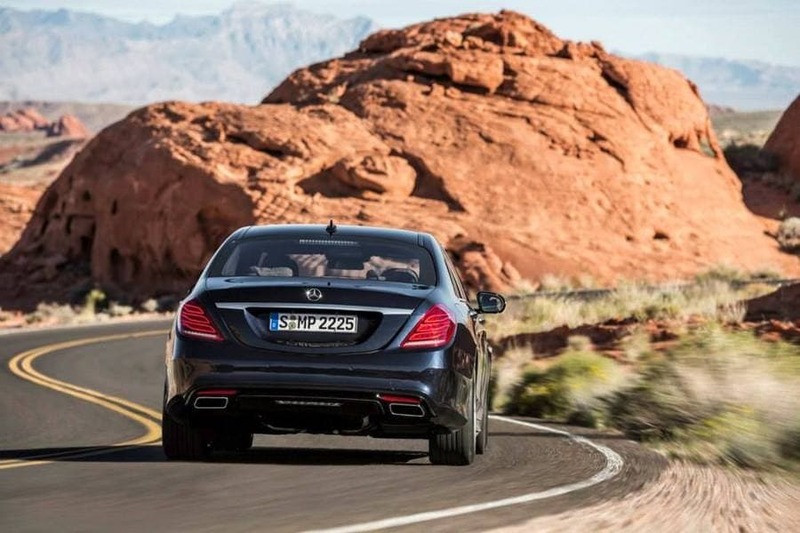 The extravagantly sculpted surfaces and lines of the side wall on the new S-Class generate excitement as they flow into the rear end. As well as being elegant, the slightly slanting form has aerodynamic advantages. Horizontal lines running from the boot lid to the bumper emphasise the car's width when viewed from the rear. 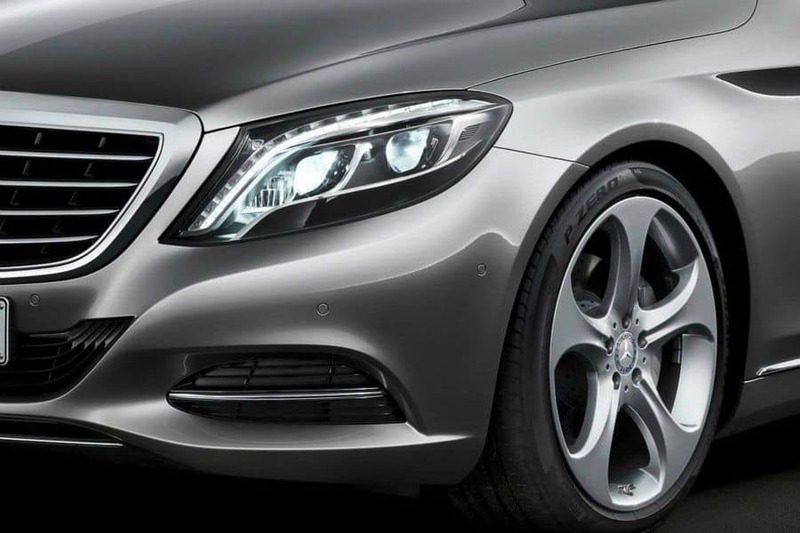 The hallmark signature of the Mercedes-Benz designers can also be seen in the rear windscreen, which cuts into the C-pillars. The upper area of the glass is rounded to give it a coupé-like character. The three-dimensional chrome insert on the boot lid adds a new dimension in high-quality design. 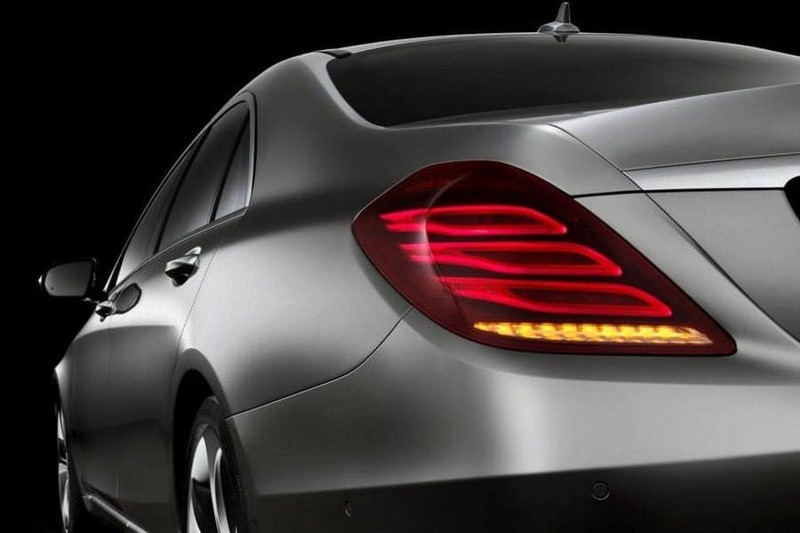 The real highlights are the new-style tail lights which are completely encased by the car body and, thanks to this solitarily integrated styling, complete the design right down to the last detail. Their meticulously crafted inner workings reflect the current state of the art. 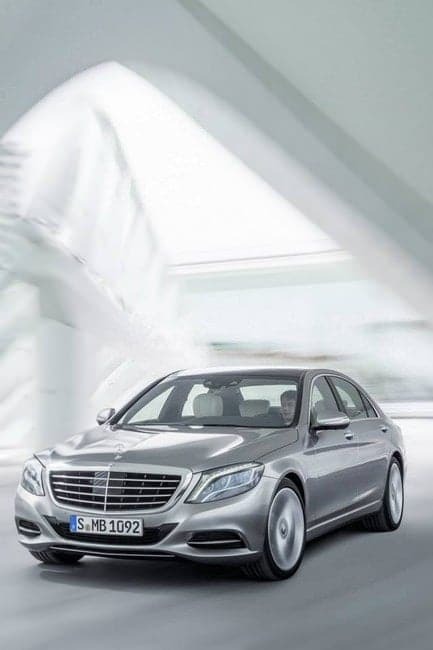 Featuring three horizontally arranged fibre-optic cables, the design echoes the hallmark Mercedes meander and so ties in seamlessly with the long line of predecessor models. The combination of attention to detail with exacting technical requirements is apparent in both the night and the day design. The rear fog lamp is housed in the centre of the bumper, while the reflectors are elegantly integrated on the left and right sides. 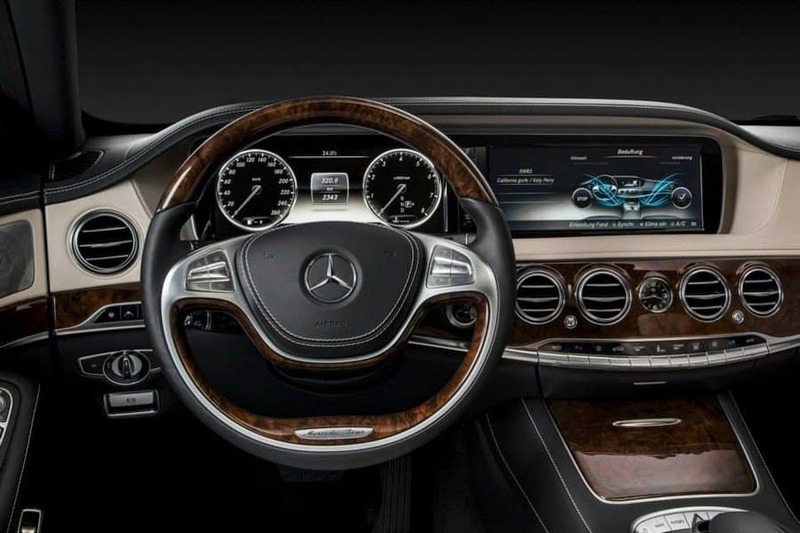 The radically redesigned display extends behind the two-spoke steering wheel – reminiscent of the S-Class heritage – as a key element of the horizontal alignment. 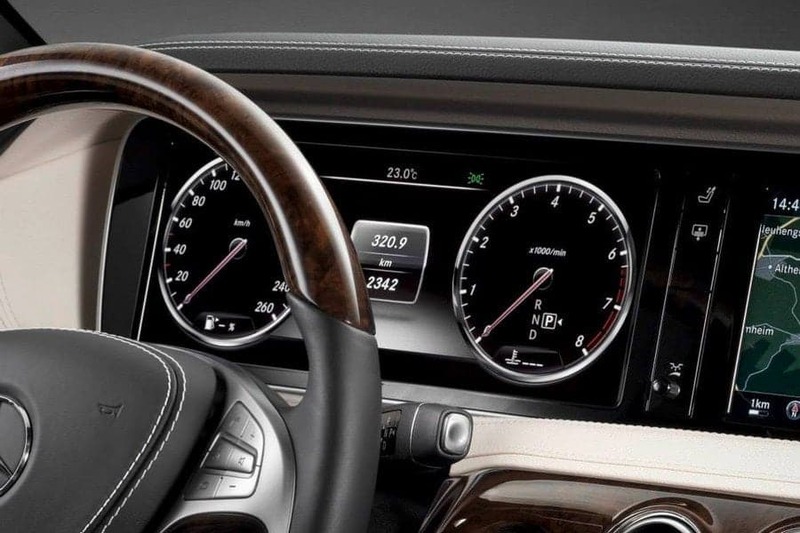 It replaces the traditional instrument cluster and combines numerous other functions in a visually and ergonomically highly sophisticated manner (see "New display concept" section). The entire display unit appears to be freefloating, an impression reinforced by ambience backlighting. 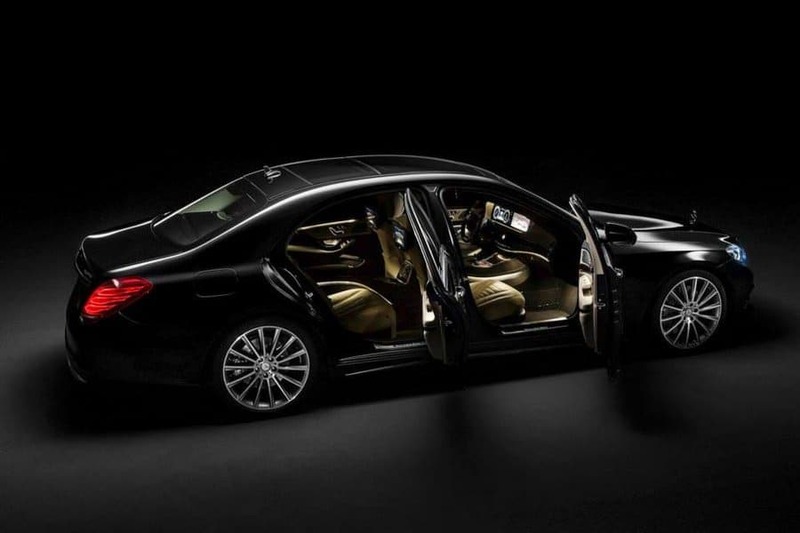 Passengers in the rear are also seated in first-class – the design and exclusivity of the seats, door panels and all controls are to the same, high standard as the front. If a luxury or reclining seat (Executive seat) is specified for the rear, the backrest inclines backwards into the parcel shelf, which means that legroom is not restricted even in the resting position. As an additional individualization feature, the "First Class Rear" incorporates a Business centre console combining personal comfort with practical convenience (integration of a telephone handset, additional stowage compartments, folding table, etc.). The side finishers of the front seats are formally integrated and feature useful stowage compartments (see "Seats" section for details). five different types of exotic wood trim. 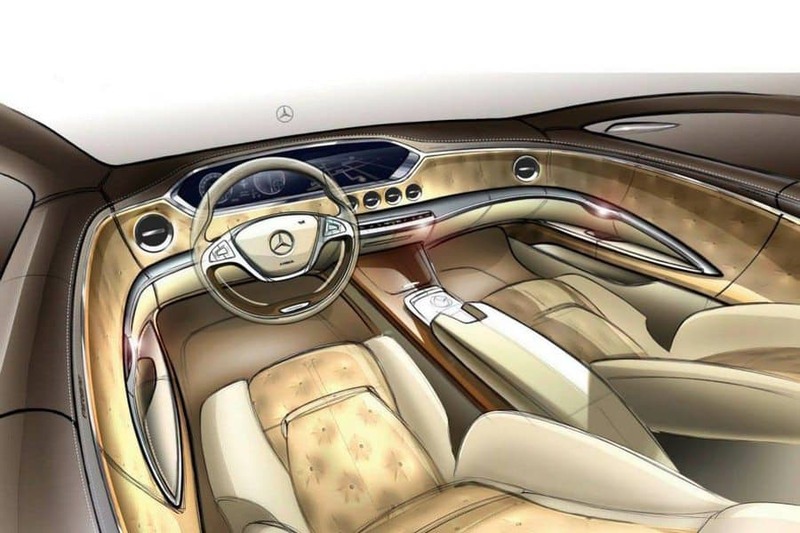 The interior design of the new S-Class was also influenced by the Mercedes-Benz Advanced Interior Design Studio in Como, whose primary task was also to explore how the highest possible perceived quality can be created. Using the so-called "appreciation model", the designers were able to give free rein to their imagination and look for ways of translating these ideals into series production features. This led to a harmonious and luxurious interior whose design, character and perceived value are unrivalled. 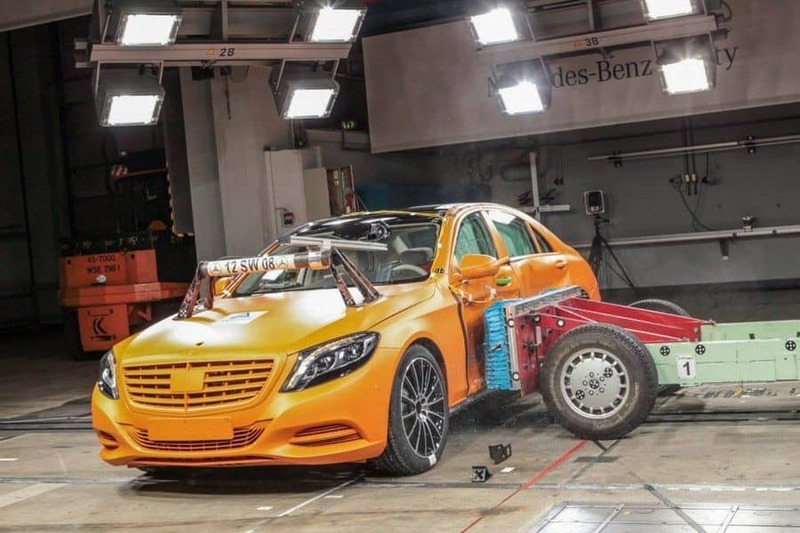 For almost three decades, the aerodynamic specialists at Mercedes-Benz have been breaking one record after another. At present the brand's models occupy the top position for aerodynamics in practically every vehicle segment. 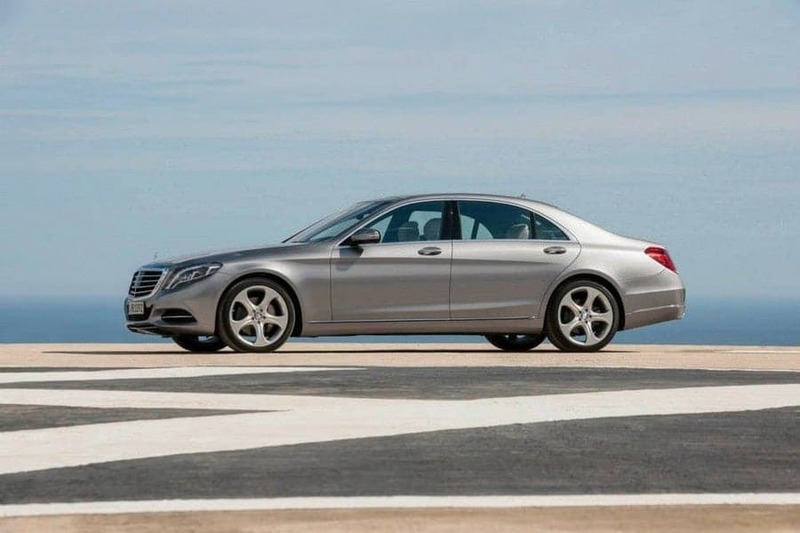 The new S-Class is likewise at the top of its segment in terms of aerodynamics and aeroacoustics. 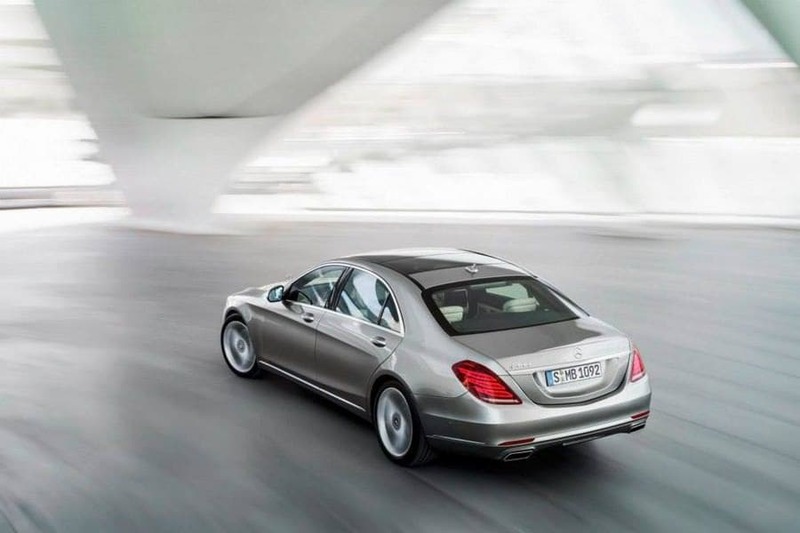 The drag coefficient of the new S-Class (cd=0.24) undercuts the previous model's figure by two hundredths and sets a new benchmark in this segment. The aeroacoustic specialists took specific measures to counter wind noises during their aerodynamic development work. To reduce high-frequency wind noise, the sealing systems around the windows and door handles were above all improved considerably. The newly designed exterior mirror and the correspondingly shaped A-pillar with a minimised shoulder height ensure the efficient drainage of water and spray hitting the windscreen, prevent the airflow from breaking off at this point and therefore avoid noises that might enter the interior via the windscreen and side windows. 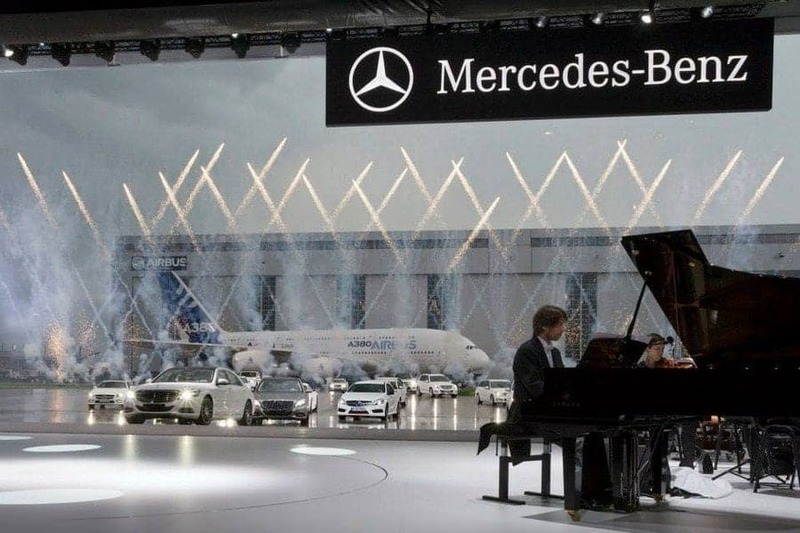 The roof structure and the automatic tilting/sliding roof module were subjected to further aeroacoustic development to improve noise comfort in this area as well. In the case of the panoramic sliding sunroof, numerous air deflection measures, covers and seals with the appropriate geometry ensure the same high level of noise comfort as in the preceding model, despite the larger opening aperture. 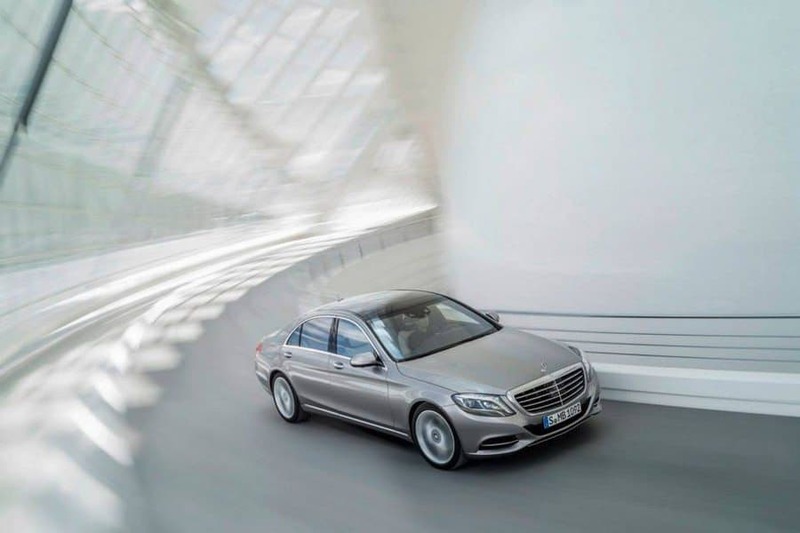 The combined effect of these measures allows the new S-Class to achieve the desired aim of being the quietest vehicle in its segment. 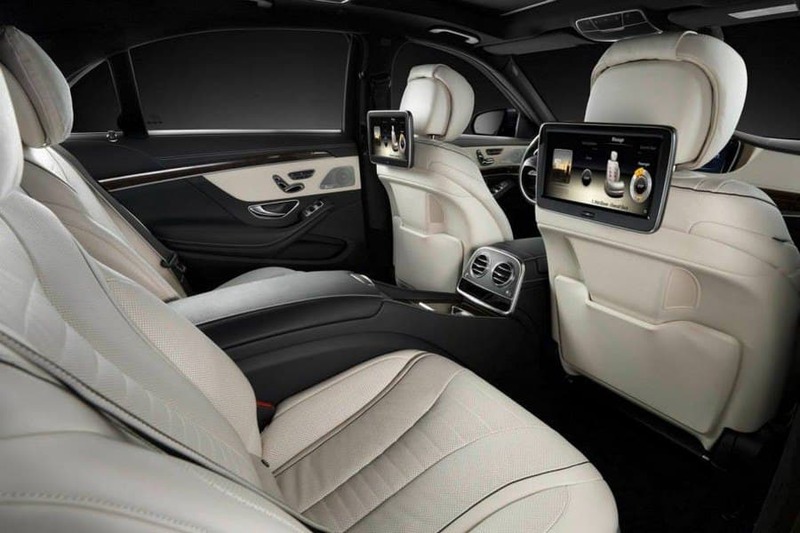 A subdued, scarcely perceptible level of noise in the interior of the S-Class was the objective when configuring and coordinating the sound insulation measures. Particular attention was paid to transmitted engine noise and road roar. 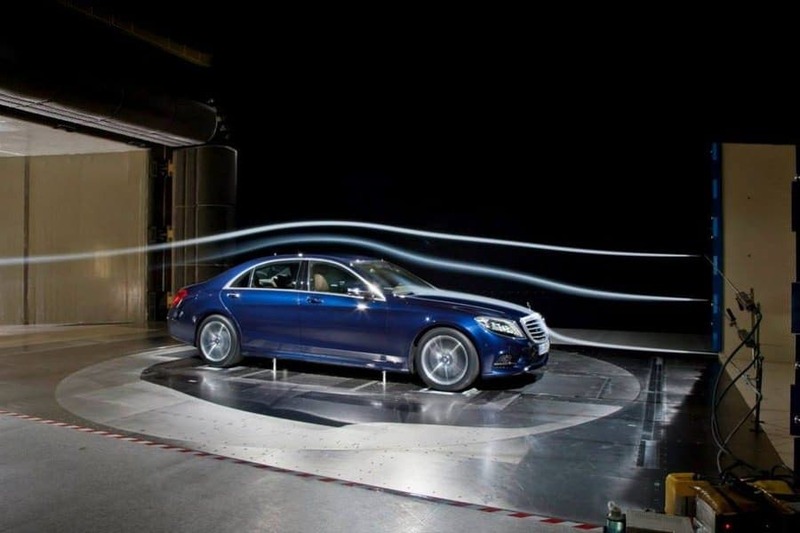 During the acoustic optimisation work, the focus was both on lowering the sound pressure level and on achieving the well-balanced and comfortable overall sound perception that is a hallmark of the S-Class. To ensure that engine noise is perceived as refined and unobtrusive in the interior, the firewall insulation was extended into the side areas of the A-pillars. Additional sealing levels were also added in the form of high-quality injection-moulded components. A major contribution to the reduction in transmitted engine noise was made by improved insulation in the transmission tunnel area, as well as a modular engine partition made of plastic. The different noise characteristics of the engines are taken into account by the use of different weights per unit area. The electrically adjustable rear seats available as an optional extra are free-standing. High-frequency tyre noise was reduced by a large area of insulation extending from the seat surface to the rear panel and parcel shelf. Breakthroughs are kept to a minimum. An intelligent air ducting system inside the parcel shelf allows the necessary ventilation while reducing noise transmission via the parcel shelf. The textile underbody and wheel arch cladding has an insulating and absorptive effect which reduces high-frequency tyre noise in the interior. 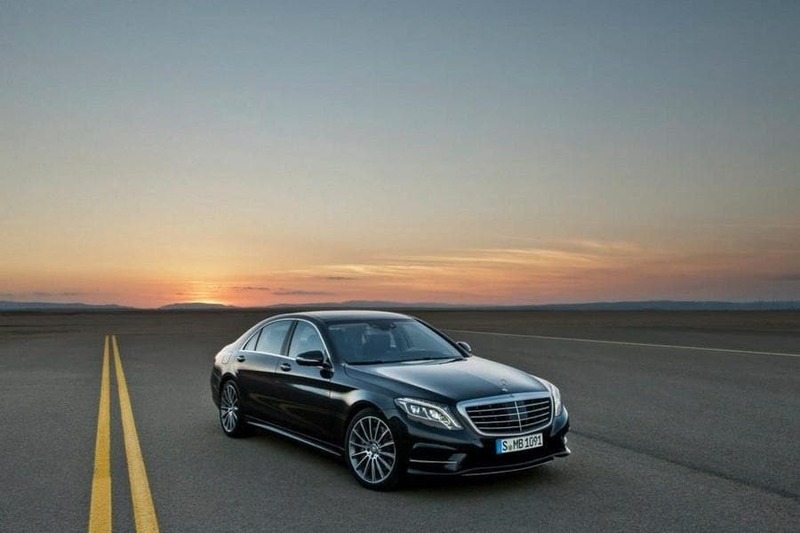 The best automobile in the world – every new generation of the Mercedes-Benz S-Class has earned this accolade anew for itself. The logical goal in the book of specifications for the coming model was therefore: perfection to the last detail. 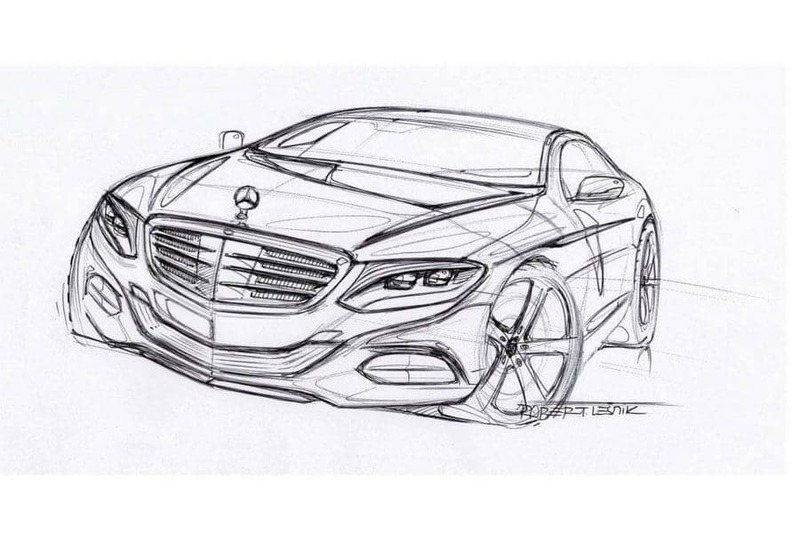 New ideas and their painstaking realization underpin the high standards that the engineers have set for the Mercedes-Benz flagship model – and for themselves. 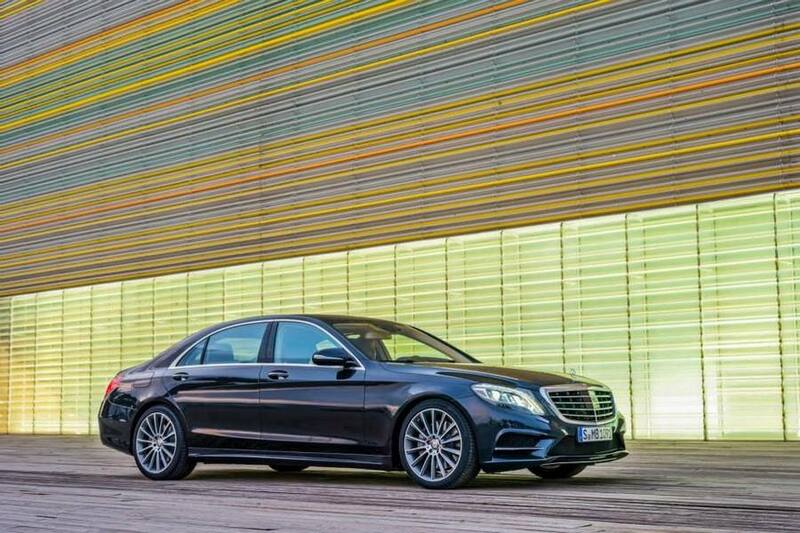 For the first time in the history of the S-Class, the development focus was on the long-wheelbase Saloon. Unlike before, the standard-wheelbase version was derived from this. 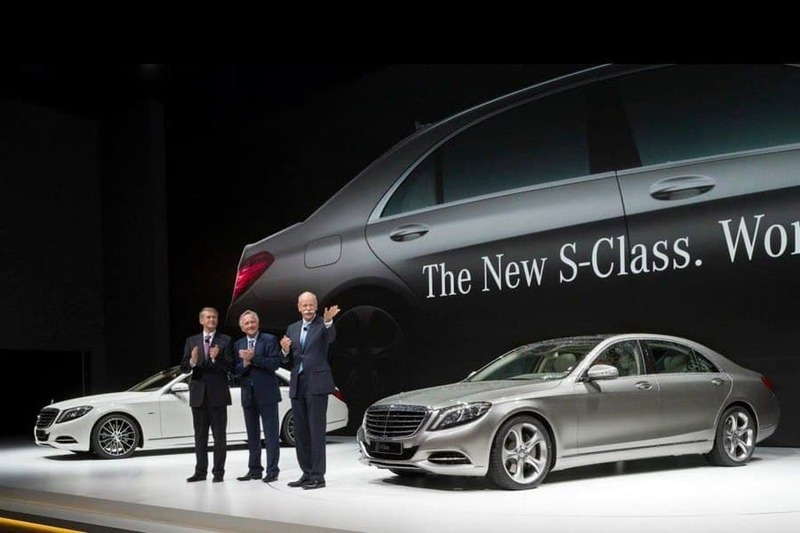 This is because the S-Class is not only firmly positioned as a prestige saloon in the large overseas markets such as the USA, China or Japan. 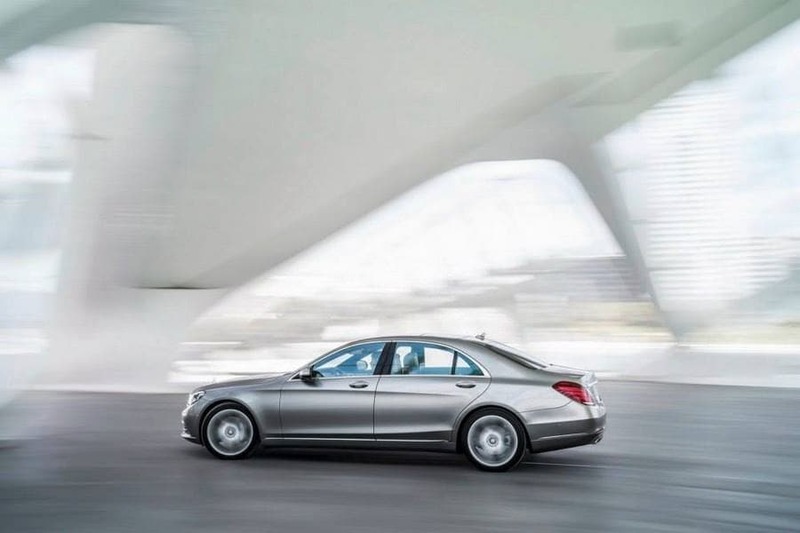 Whereas in Europe and North America S-Class owners are frequently behind the wheel themselves, the flagship model in the Mercedes-Benz passenger car portfolio is very much a chauffeur-driven vehicle in Asia. There are two body lengths to choose from: 5248 and 5116 millimetres – 42 and 40 millimetres longer than the predecessor model respectively. 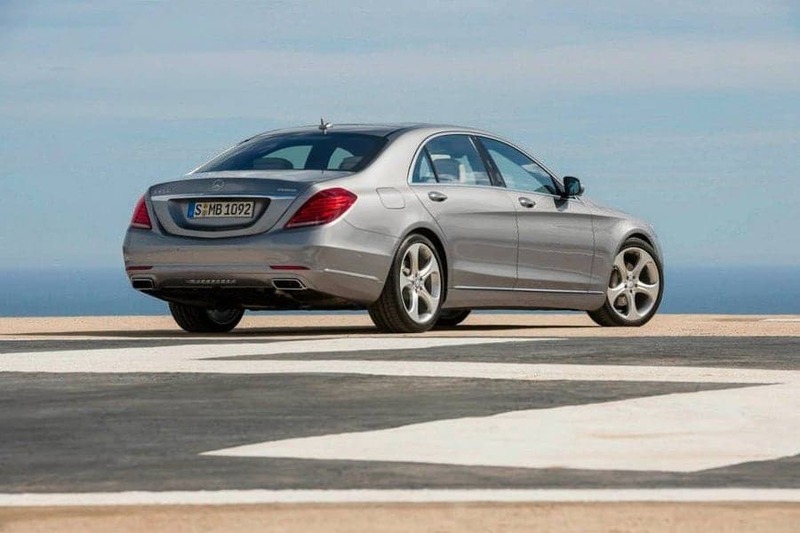 Whereas the wheelbase has stayed the same at 3165 and 3035 millimetres, the track width has increased by 24 and 31 millimetres to 1624 (front) and 1637 millimetres (rear) respectively. The occupants of the new S-Class benefit from the moderate increase in vehicle size by an improvement in all the interior dimensions: there are 12 millimetres more maximum headroom for the driver, as well as 14 millimetres more shoulder room and 10 millimetres more elbow room in the front. 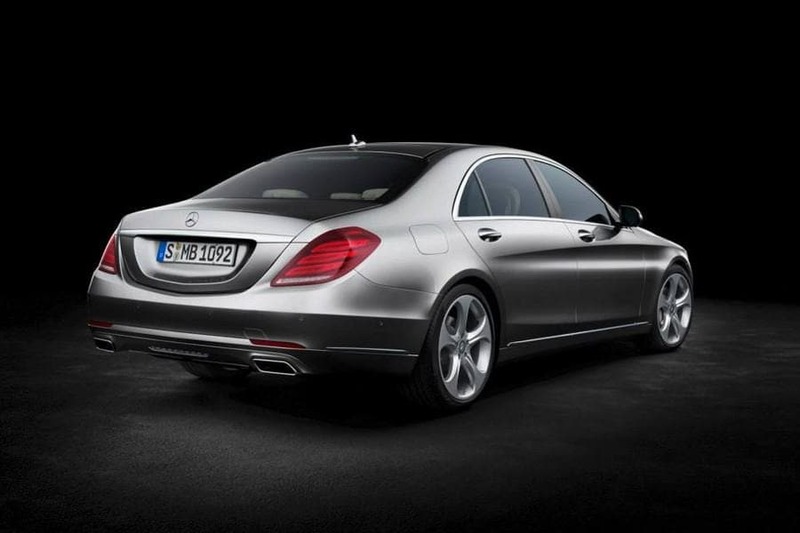 Thanks to the 14-millimetre increase in rear kneeroom, travel becomes even more comfortable for passengers in the rear. Shoulder room in the rear has been improved by up to nine millimetres. 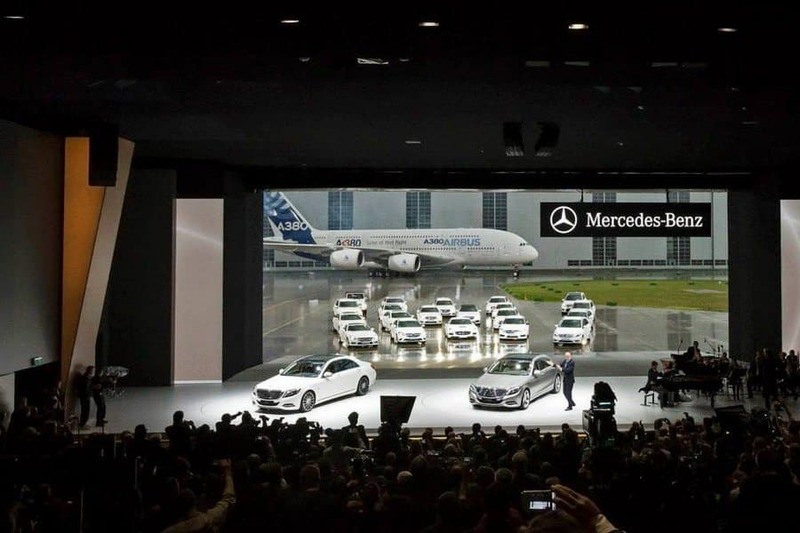 *Please note: U.S. will get 100% Long Wheelbase. 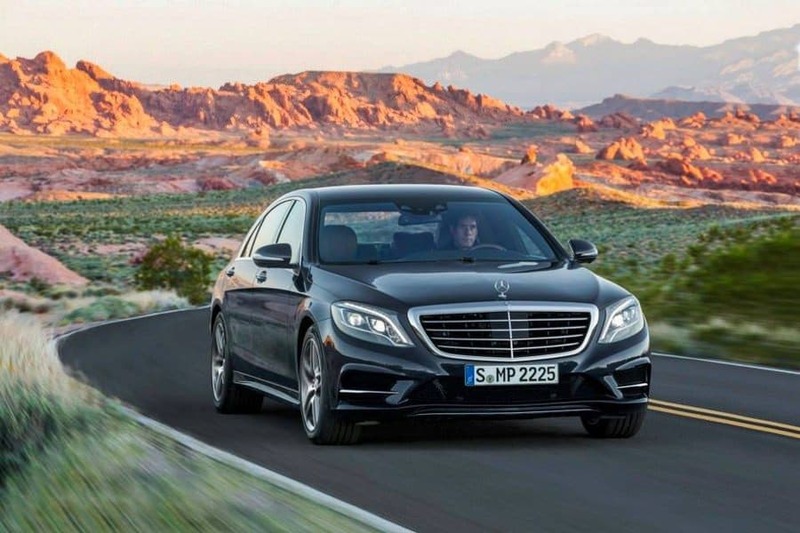 The Mercedes-Benz flagship model, which has now been known as the S-Class for over 40 years, has not only proven immensely popular with customers for many years. It also has a string of awards to its name, underlining its class. 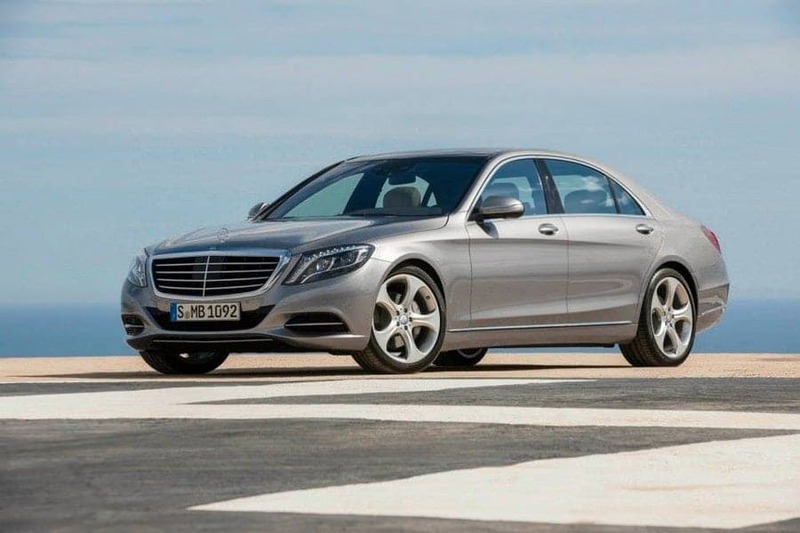 In 2011, for example, the S-Class received the award for best car in the luxury segment from the German magazine "auto motor und sport" and the accolade "Prestige Car of the Year" from "Motoring Television" in North America. 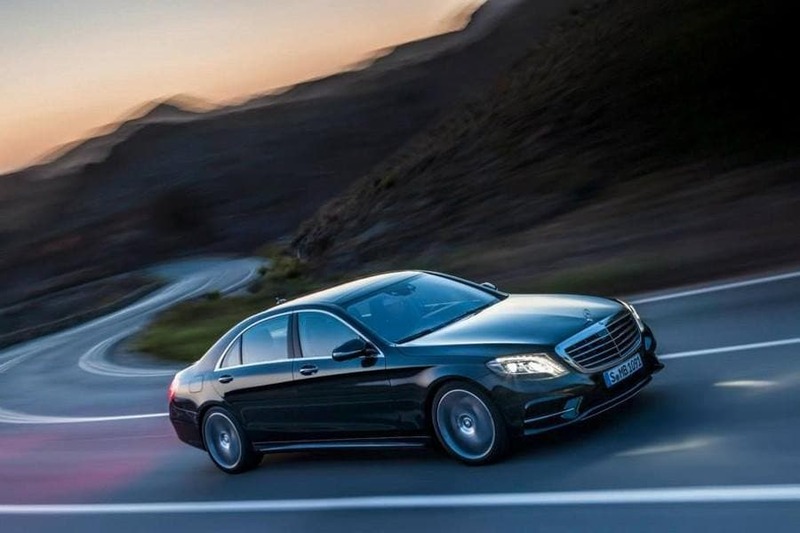 In addition to this, the S-Class won the J. D. Power APEAL Award for the best vehicle in the segment in terms of efficiency, technology and design for the fourth time in succession in 2010. 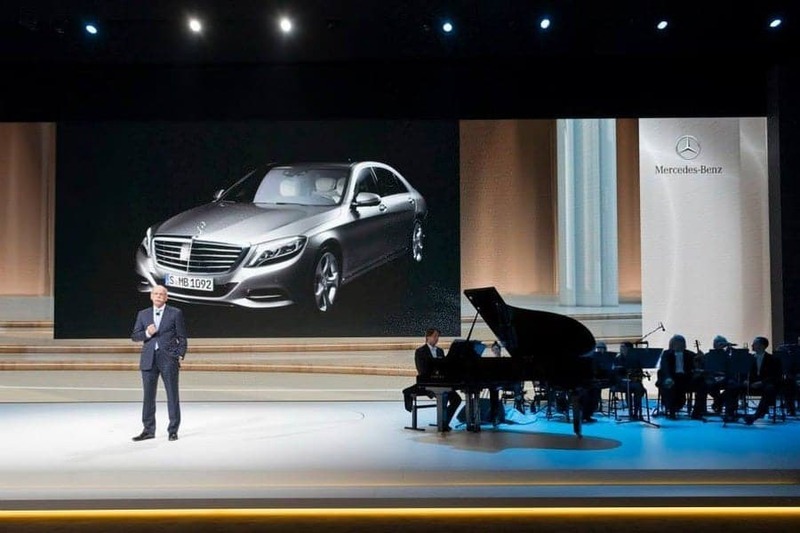 Furthermore, the S-Class underlined its pioneering role in the field of green technology in the premium segment by winning the "World Green Car of the Year 2012" award. 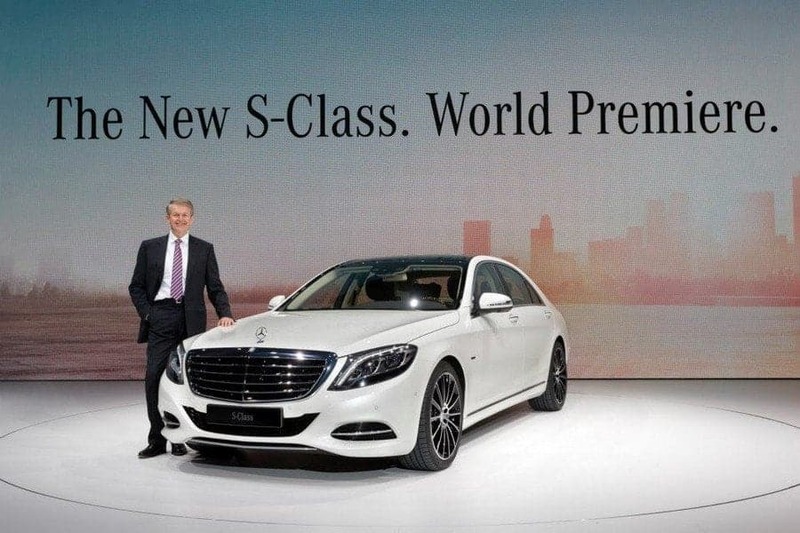 Even in the year leading up to the model change, the S-Class continued to be very popular with customers. 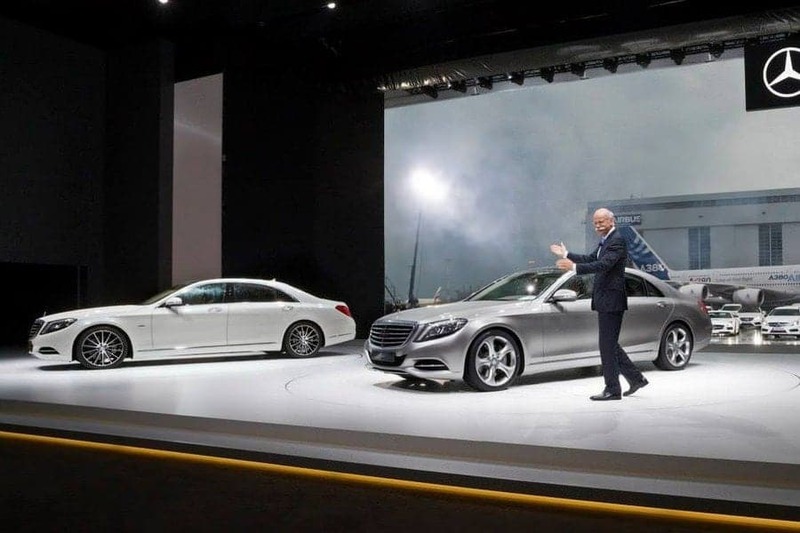 A total of 65,128 S-Class Saloon models were handed over to their new owners. 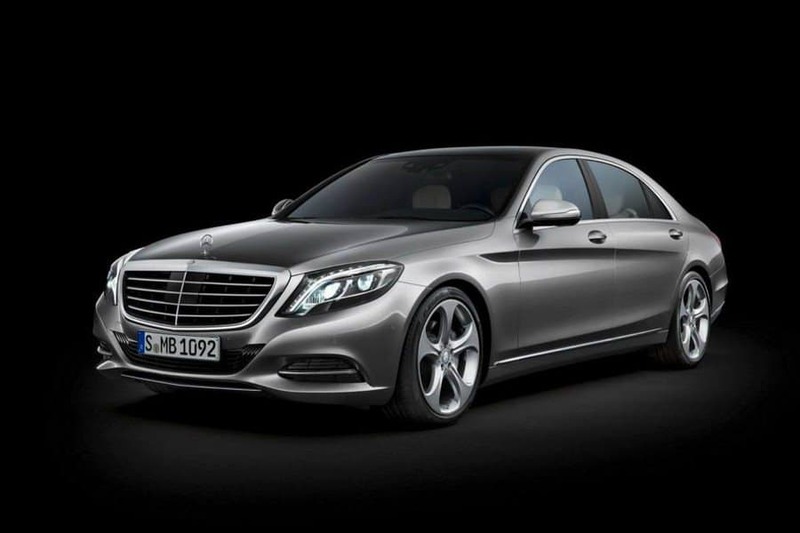 The Mercedes-Benz brand's flagship model thus remained the world's best-selling luxury saloon. 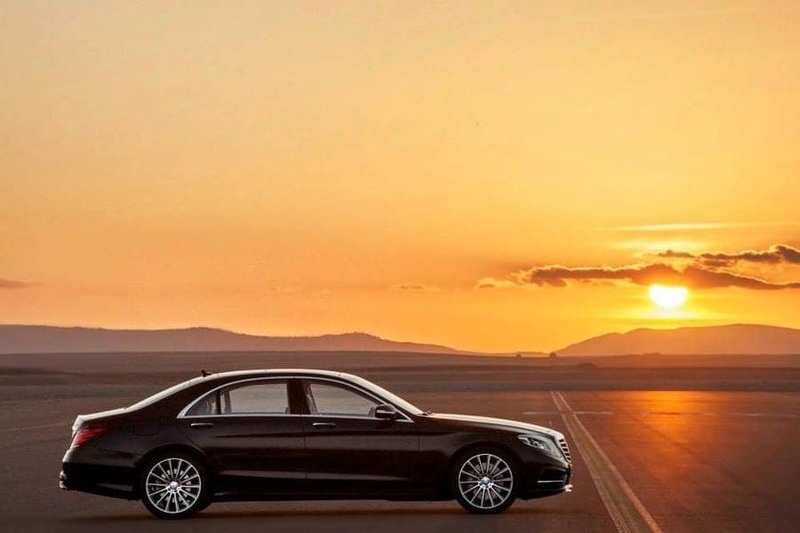 Over 500,000 models from the last S-Class model series have been delivered to customers around the world since its launch in September 2005, meaning that this S-Class sold even better than the previous generation. 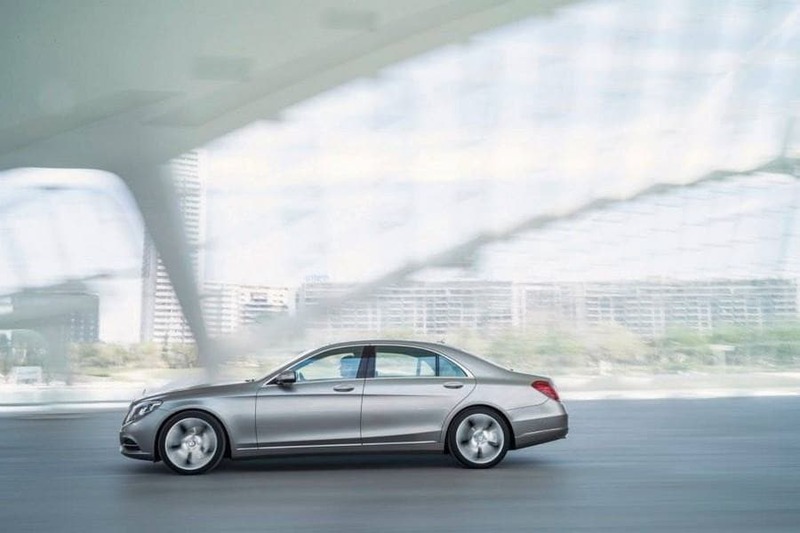 Since the launch of the 220 model that laid the foundations for the S-Class model series, Mercedes-Benz has delivered more than 3.5 million of these vehicles to customers all around the world. lights is reduced at night or while waiting at traffic lights. Meanwhile, visibility is enhanced by two assistance systems that have undergone some key improvements – Adaptive Highbeam Assist Plus and Night View Assist Plus. consumption to a quarter of that of conventional headlamps." The new energy-saving LED low-beam headlamps, for instance, require 34 watts to produce the same light output, making them notably more efficient than halogen (120 watts) and xenon light sources (84 watts, all figures per vehicle). This translates into a saving of 0.05 litres of fuel per 100 kilometres or 2.1 grams of CO2 per kilometre compared to a vehicle fitted with halogen low-beam headlamps. 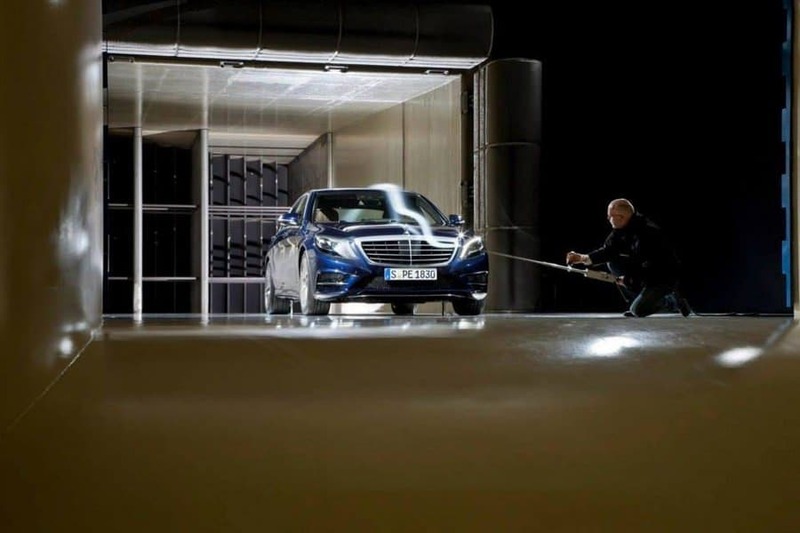 Efficiency is given a further crucial boost by new, high performance single-chip LED diodes and a newly developed projector module in the headlamp unit, in which deflected beams of light are reflected back again. 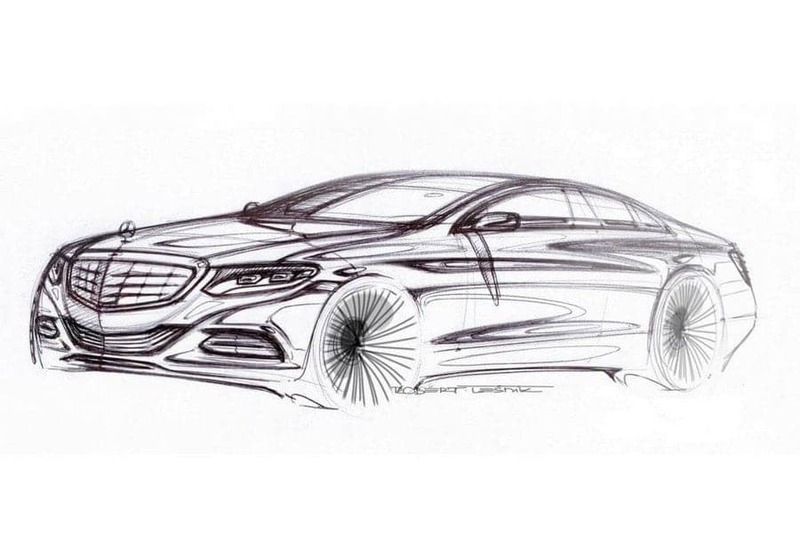 Even the entry-level model in the new luxury saloon range will come with all-LED lighting. The supplementary functions of the Intelligent Light System as well as Adaptive Highbeam Assist Plus can be added as options.